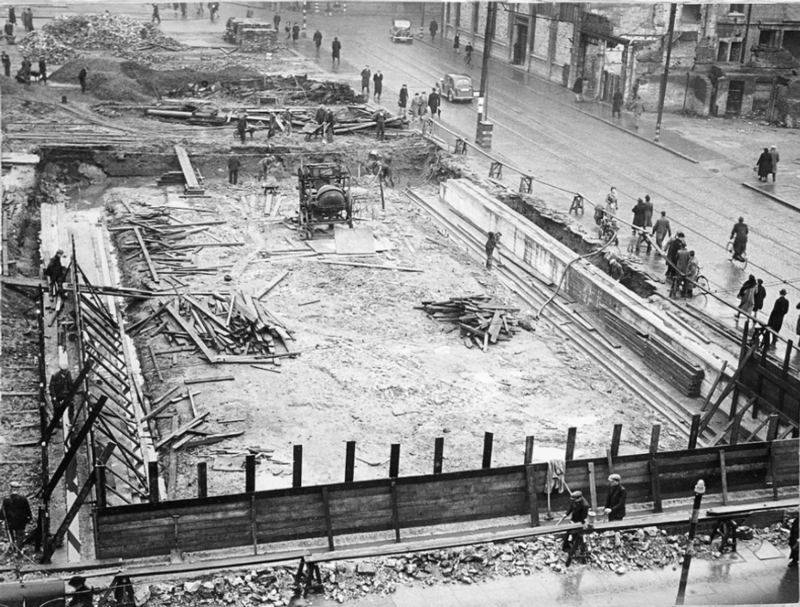 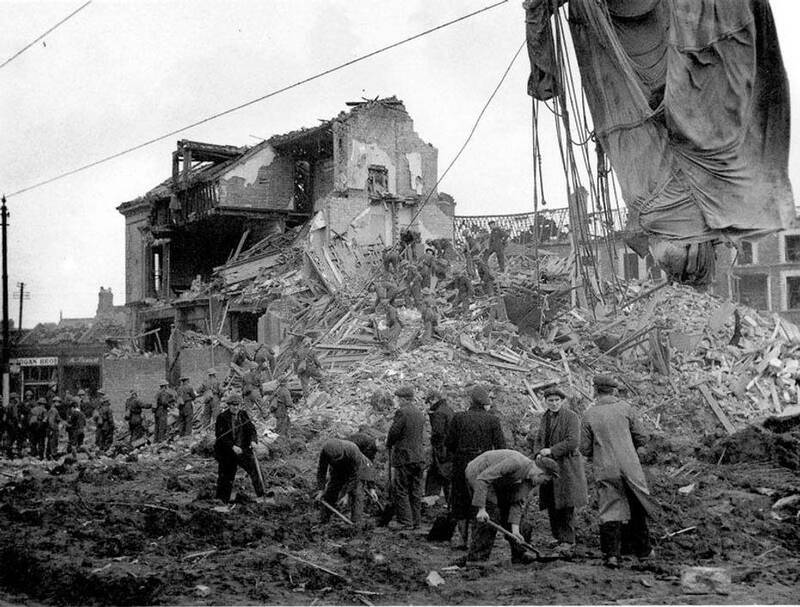 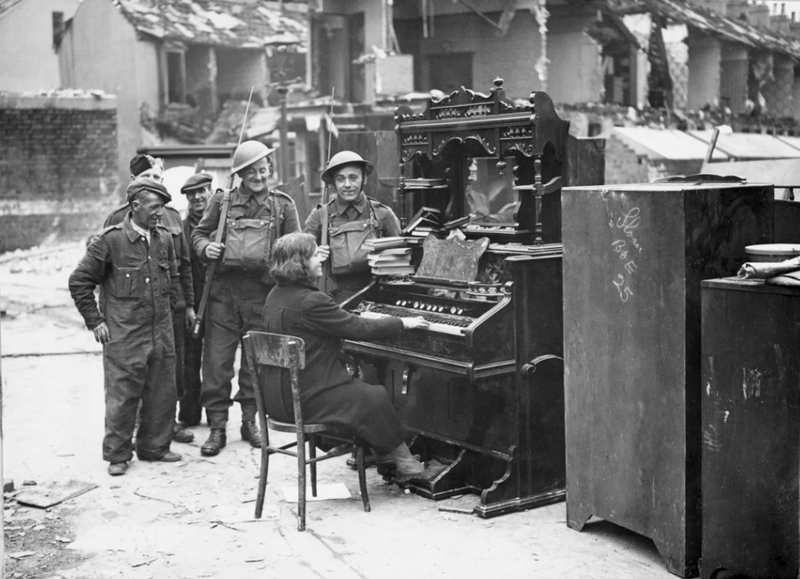 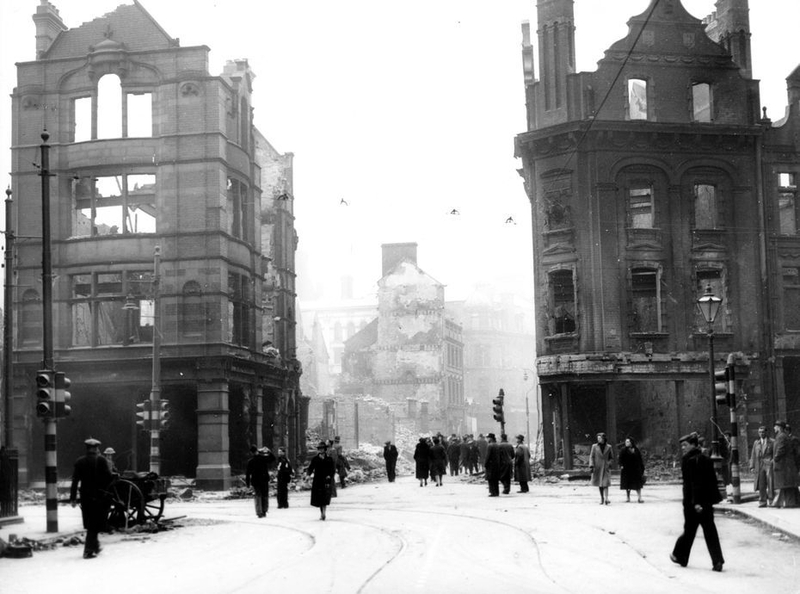 Shown here are some photographs which are designed so that you can look at a location as it is now and hopefully see who it was left following the blitz by German bombers. 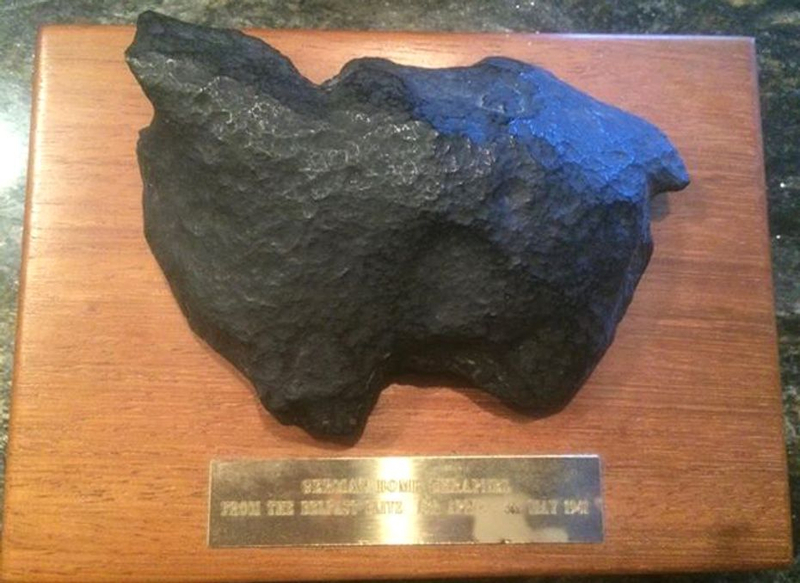 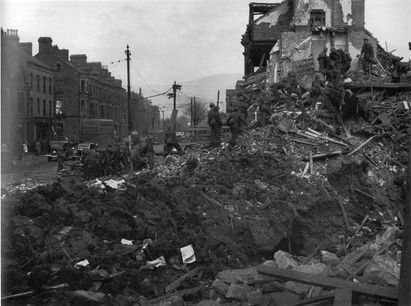 This Bomb Shrapnel from the Belfast Blitz is on display in Bagnals Castle Museum in Newry. 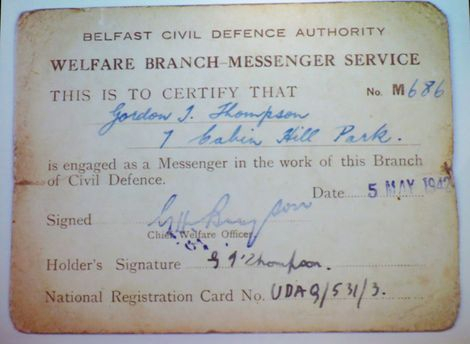 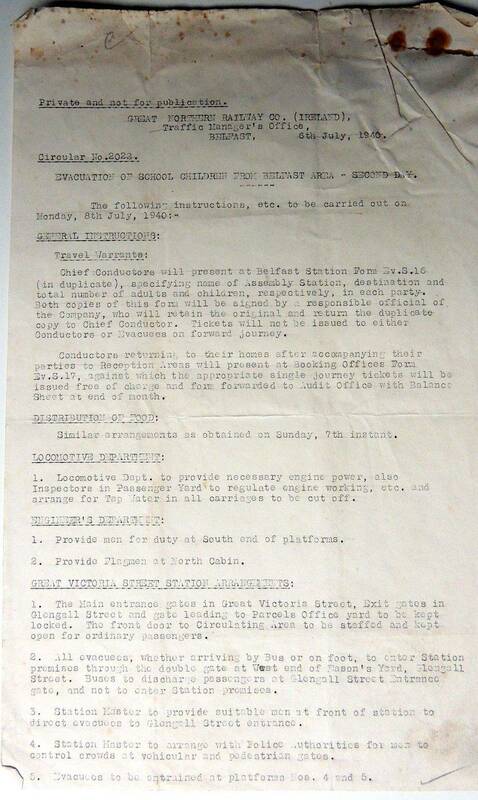 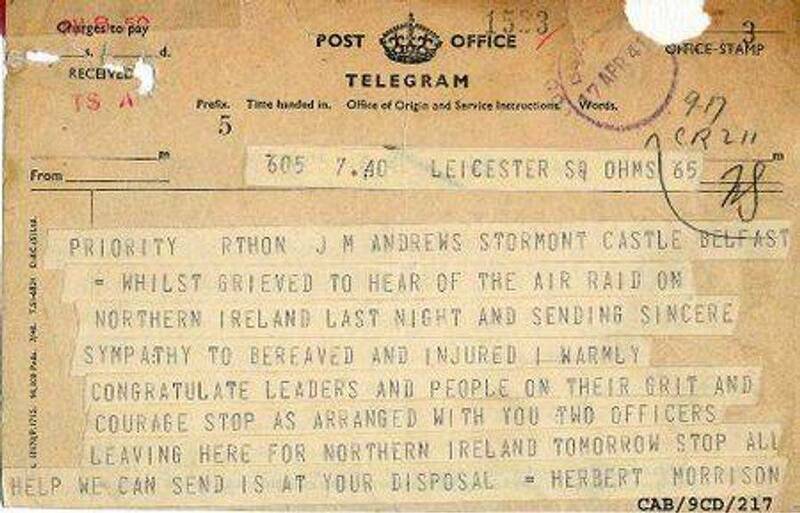 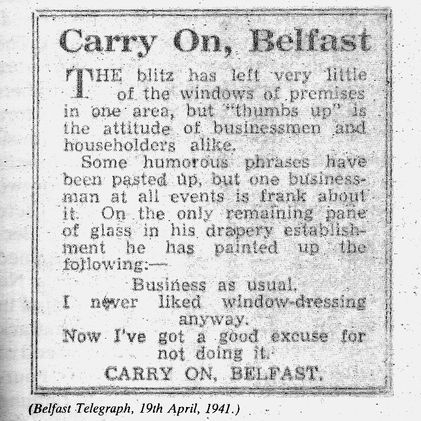 The "Carry On Belfast" comment was printed in the Belfast Telegraph Newspaper which itself had suffered during the Bombing. 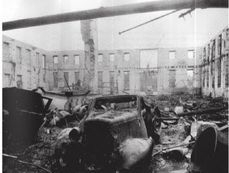 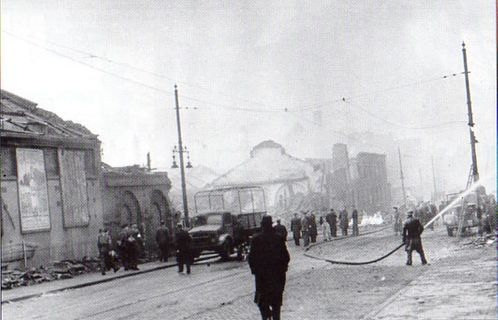 The building is shown here with considerable damage. 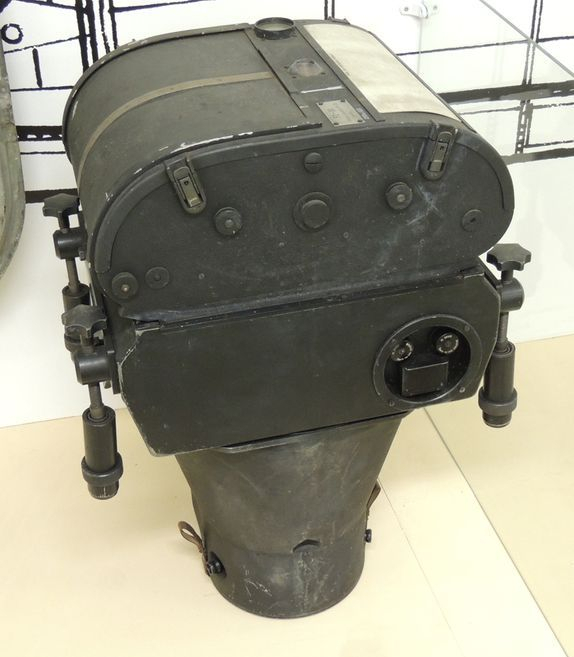 The Camera is shown on the Left with the Bomb Sight on the Right. 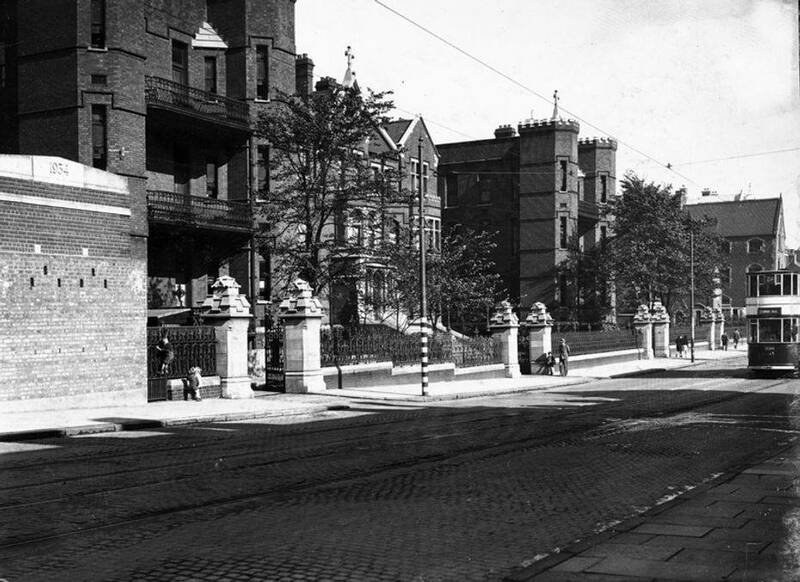 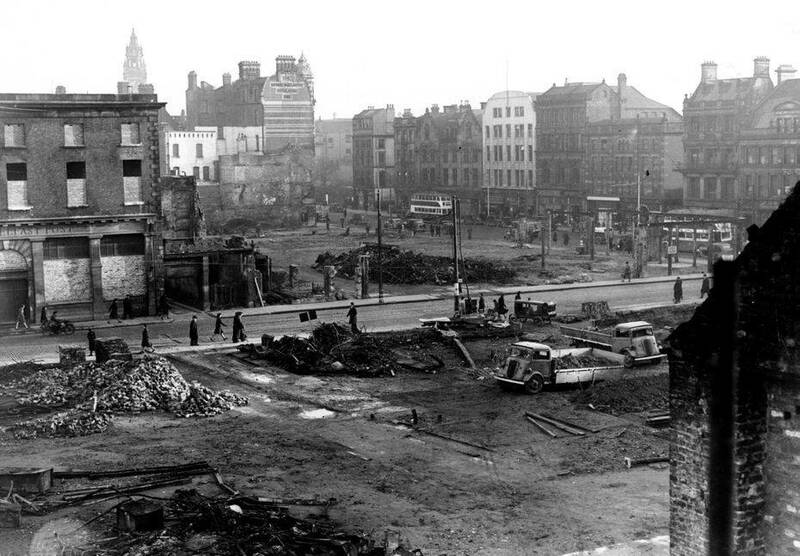 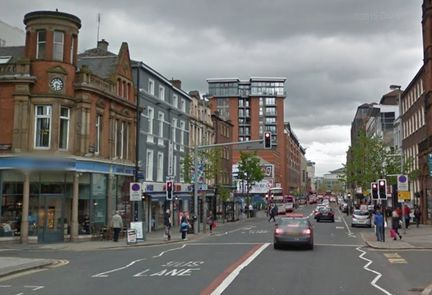 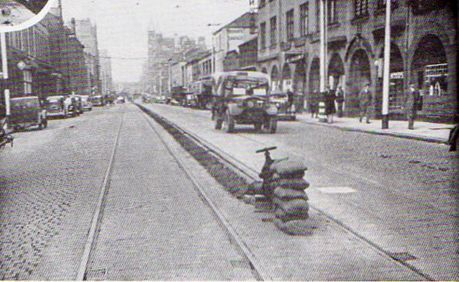 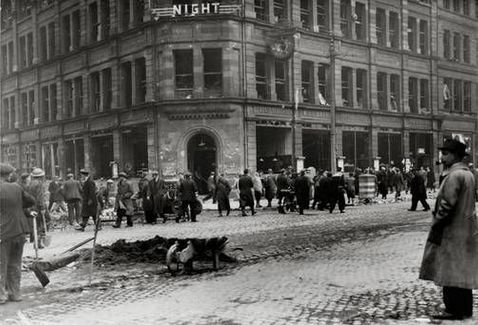 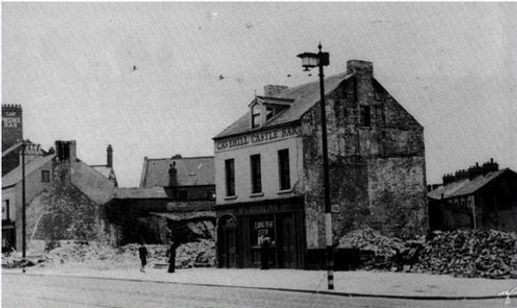 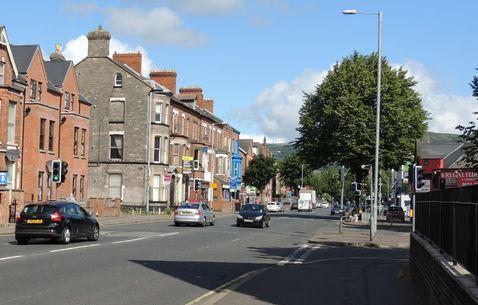 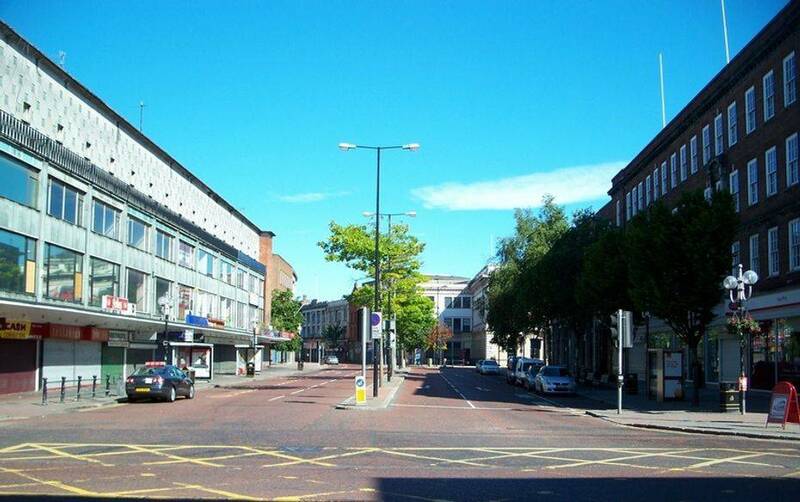 The photograph above shows the junction of Newtownards Road and Newcastle Street on the left. 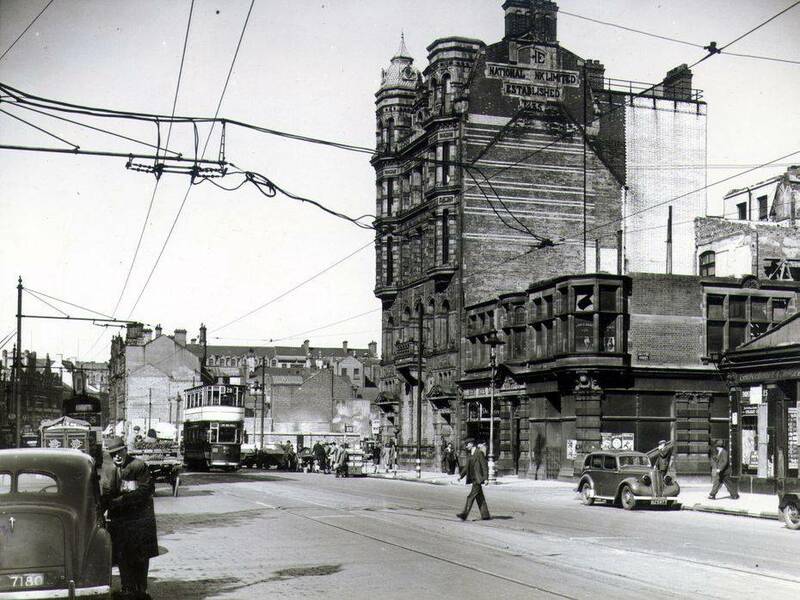 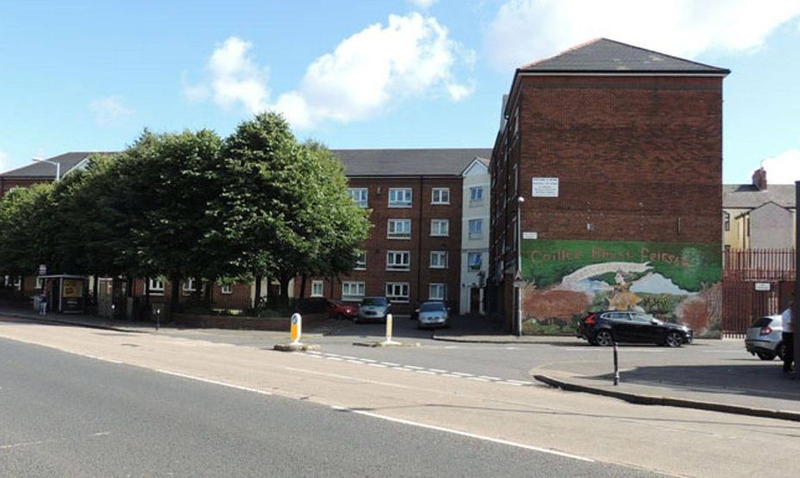 This area has changed completely and there is now a small culdesac called St Leonards Crescent. 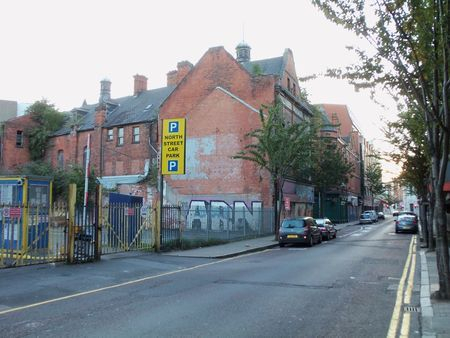 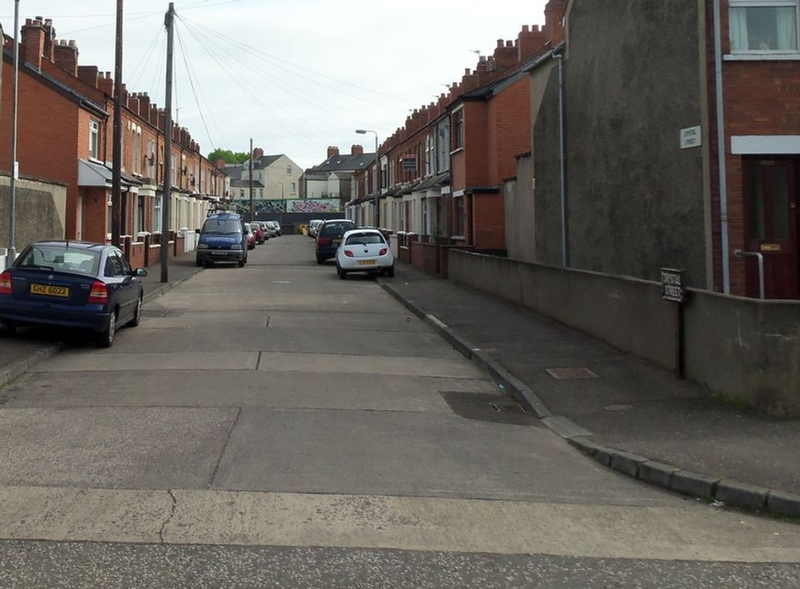 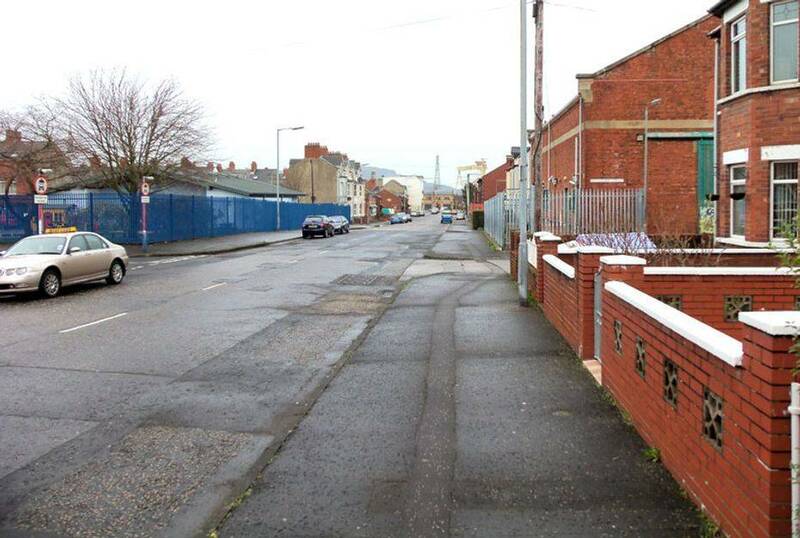 Below is the Tamar Street / Dee Street area after being cleared up. 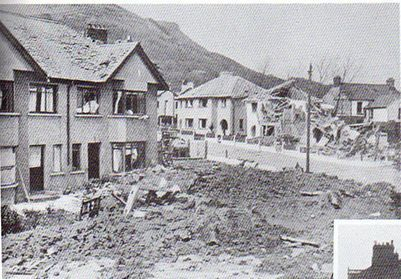 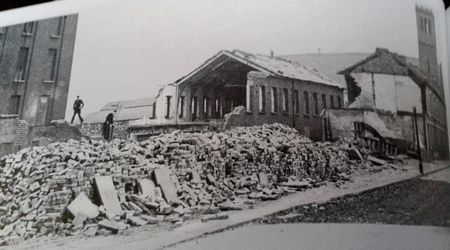 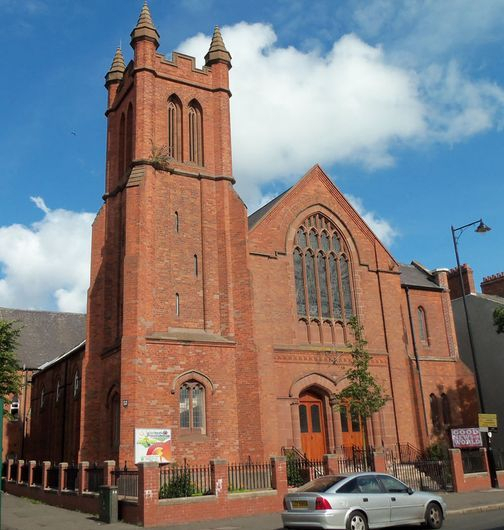 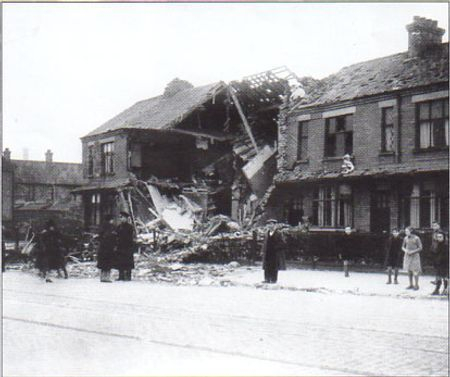 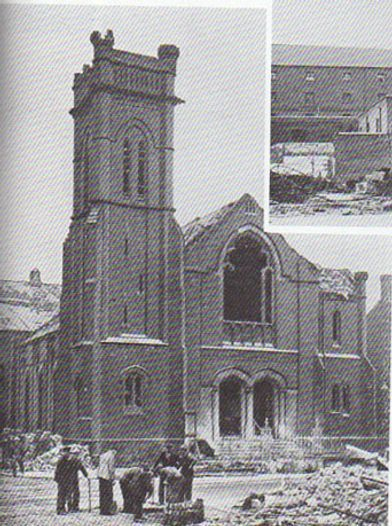 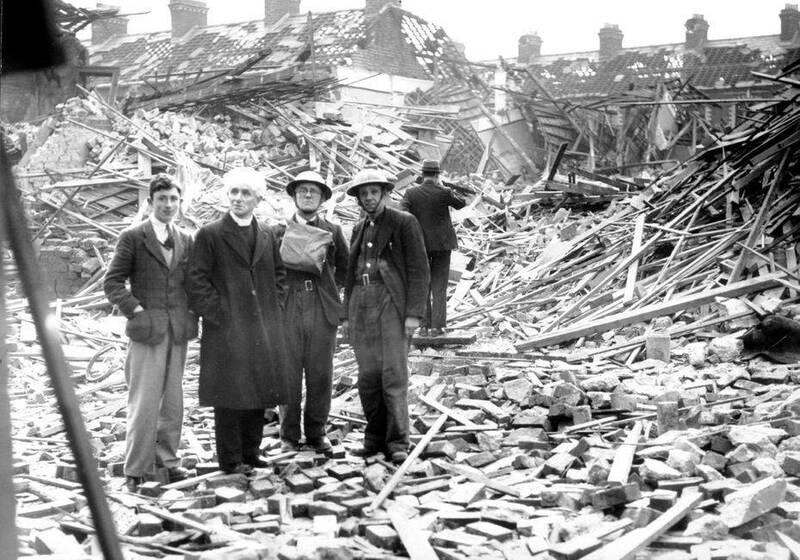 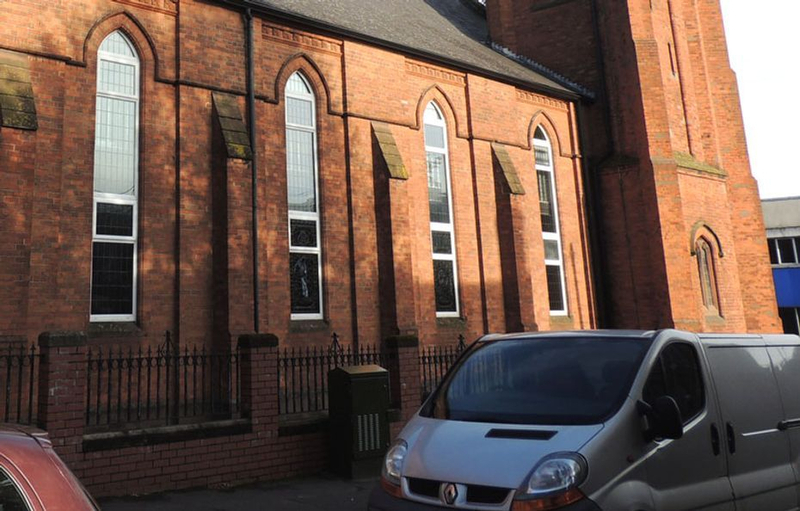 Destruction at Newtownards Road Methodist Church. 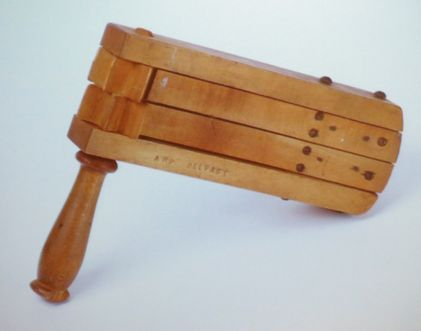 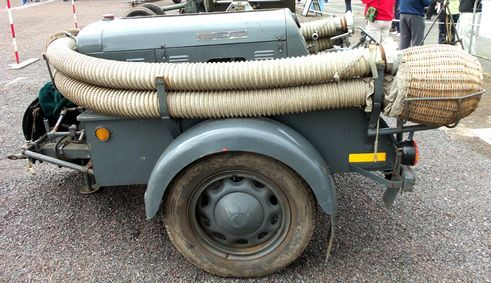 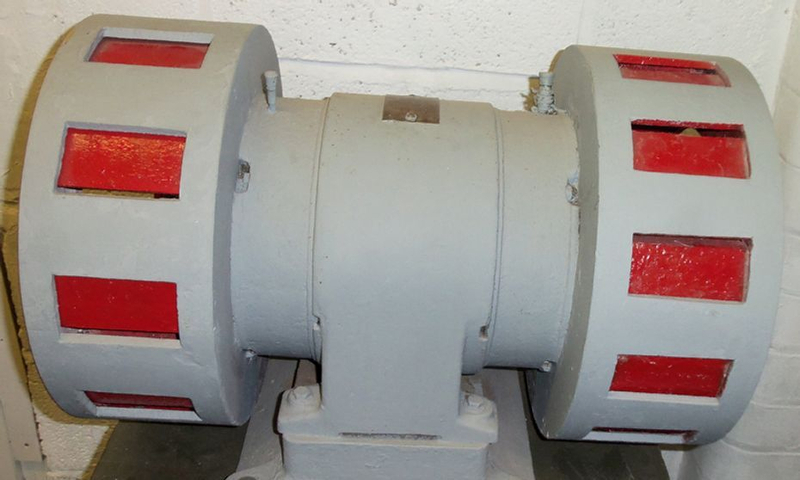 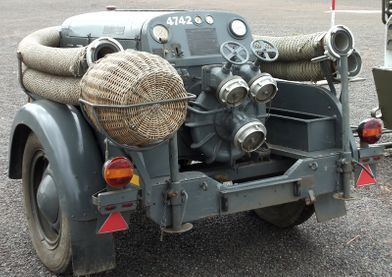 The Second World War Air Raid Siren shown here used to sit on top of a Fire Station however it has been restored and is now on display at the Ulster Aviation Society building at Long Kesh. 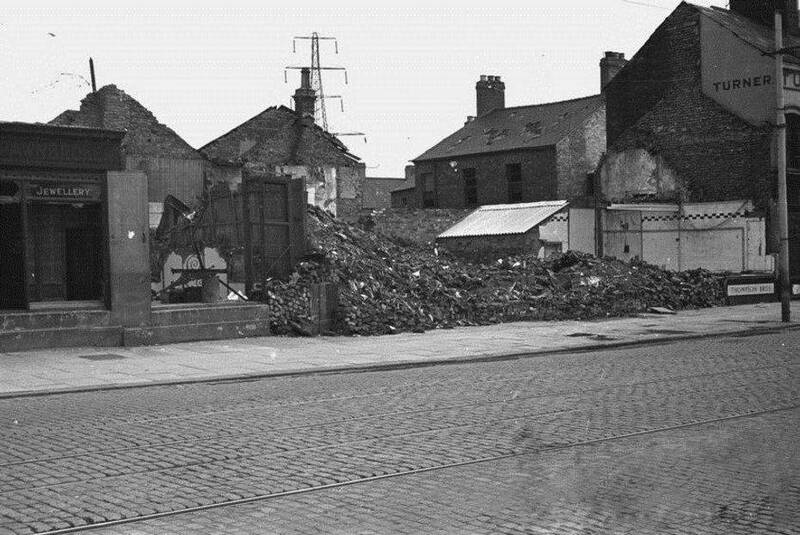 The most obvious remaining feature is the large electricity pylon in the background however the old building that can be seen behind the rubble and has 2 chimneys still remains but is obstructed by the newer buildings. 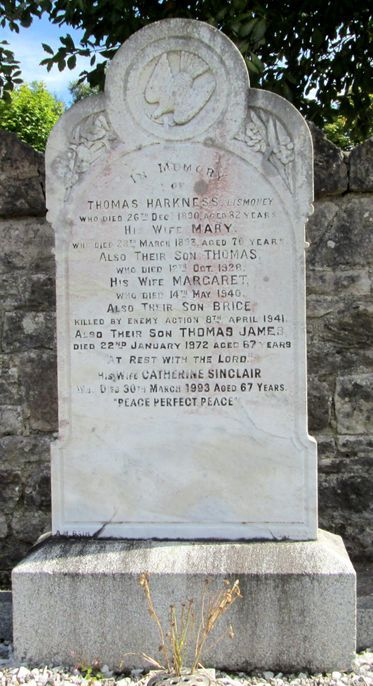 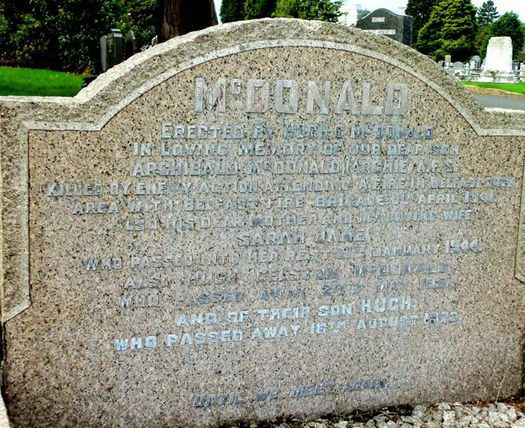 I have deliberately started this section with a picture of the Headstone of a member of the Belfast Fire Brigade who was killed during the Belfast Blitz and is buried at Dundonald. 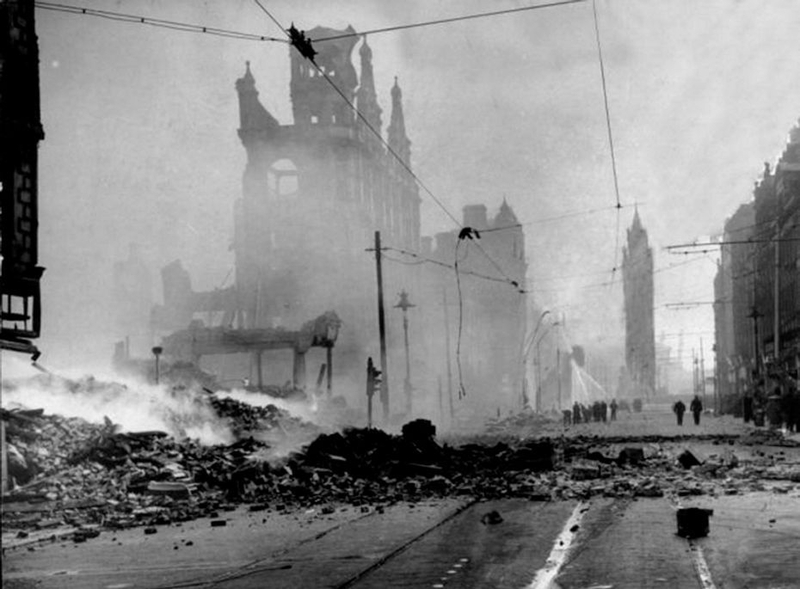 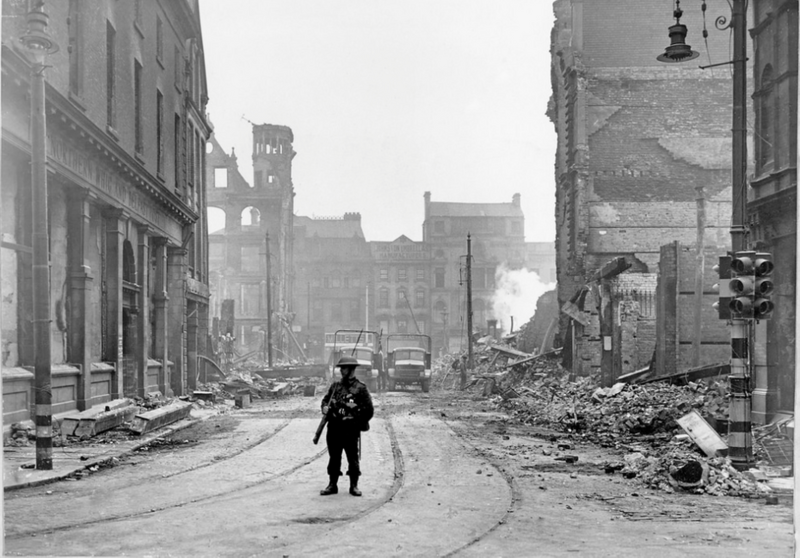 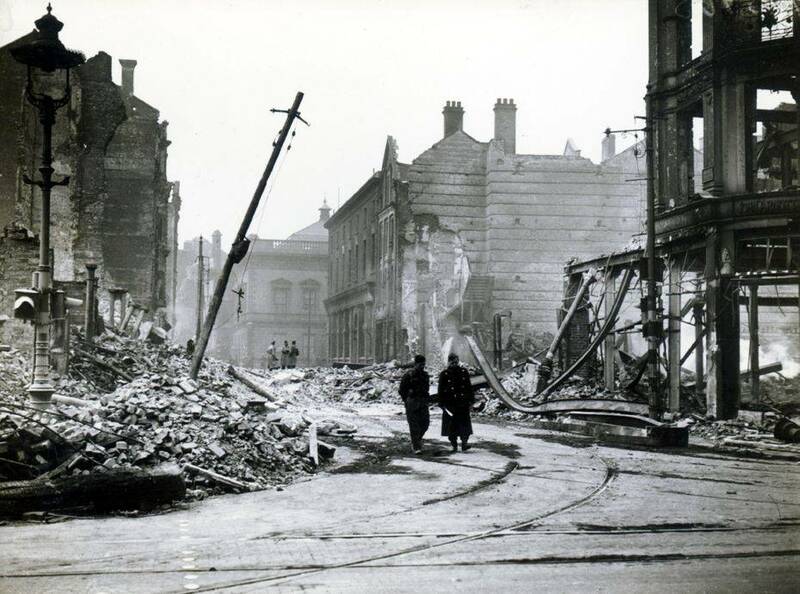 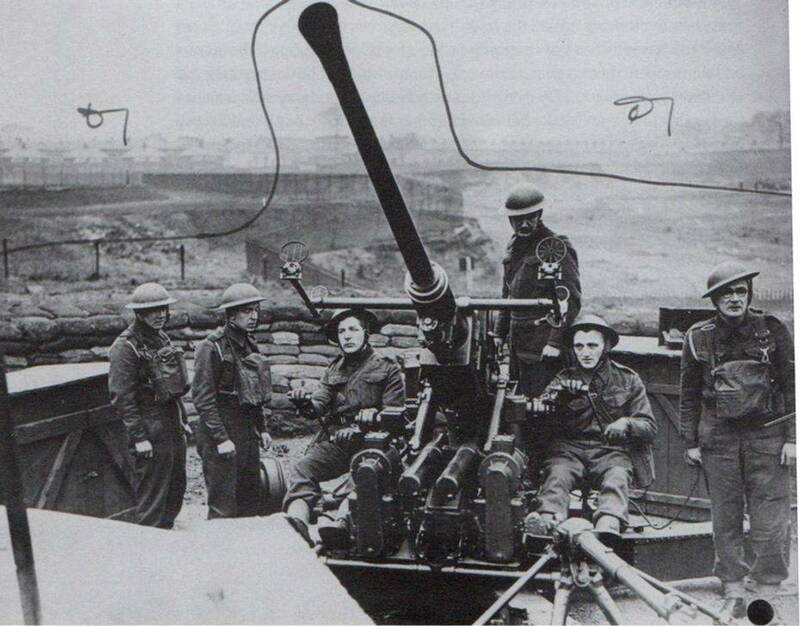 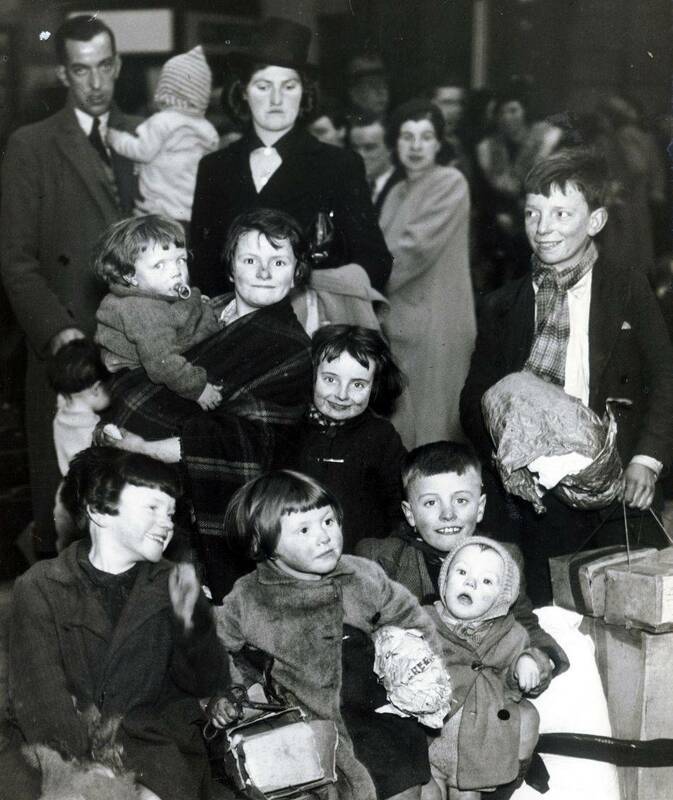 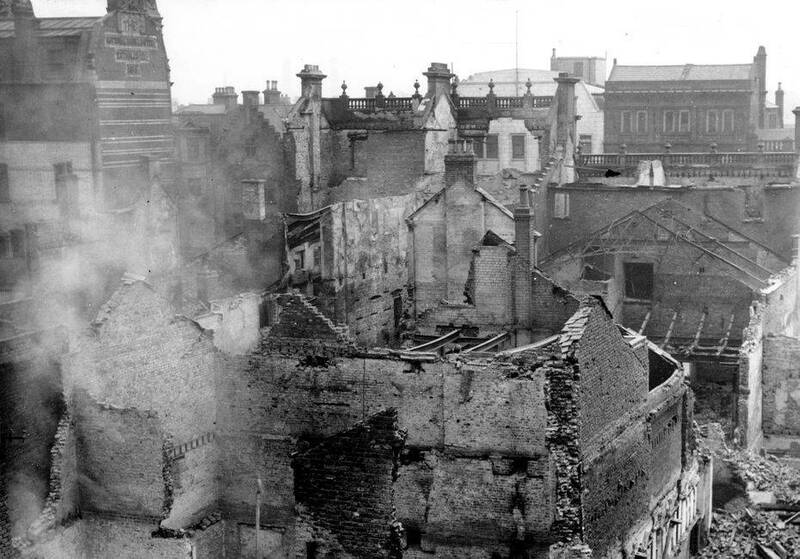 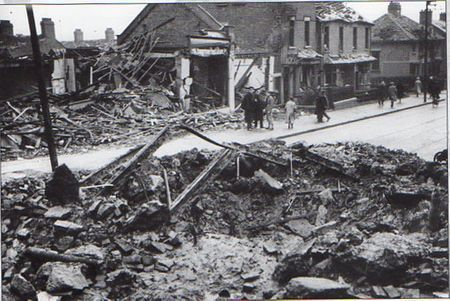 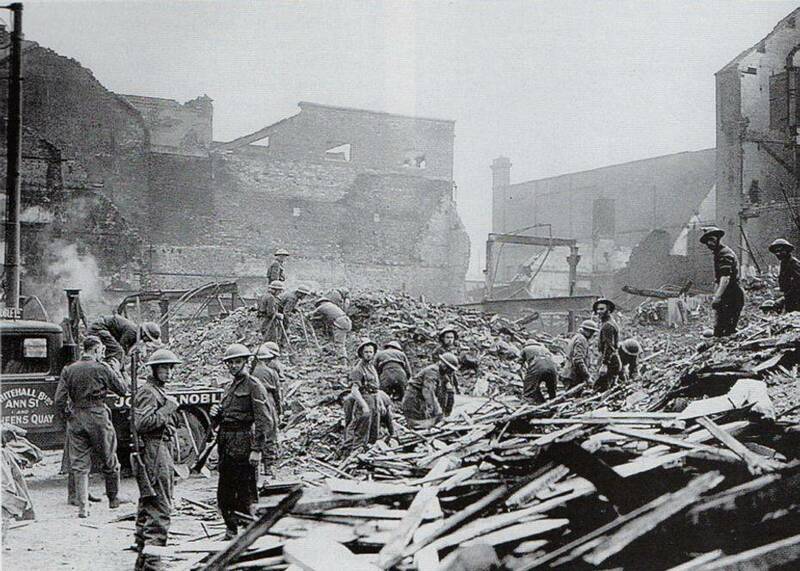 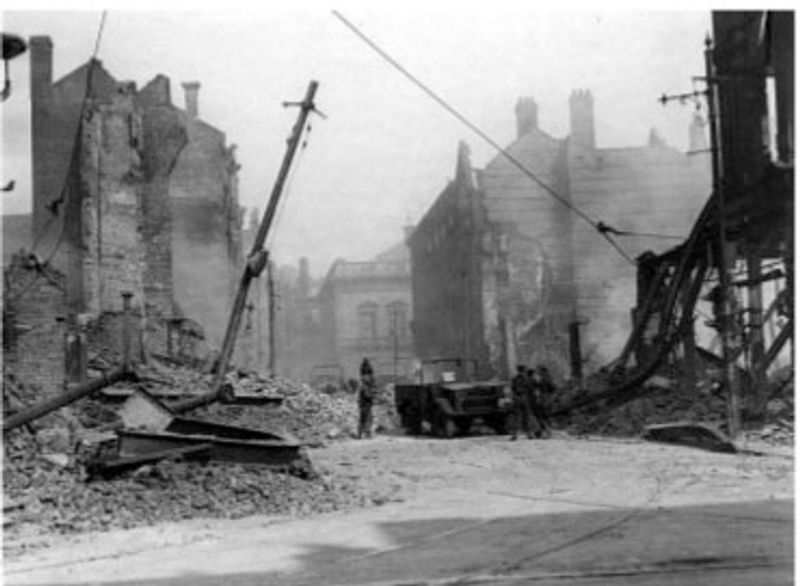 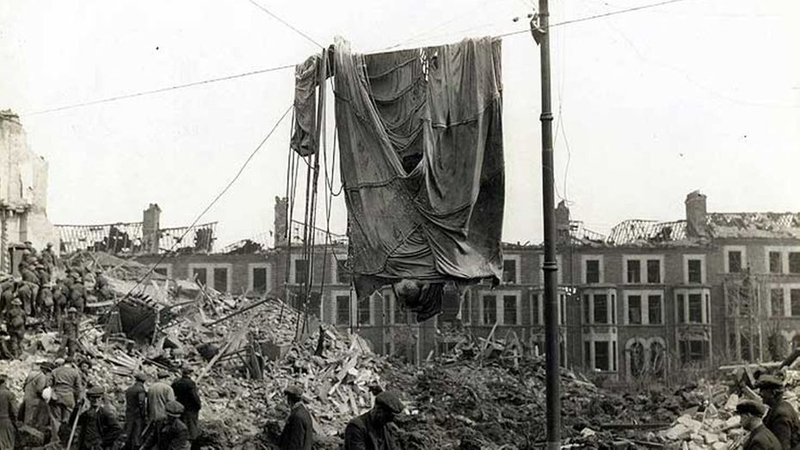 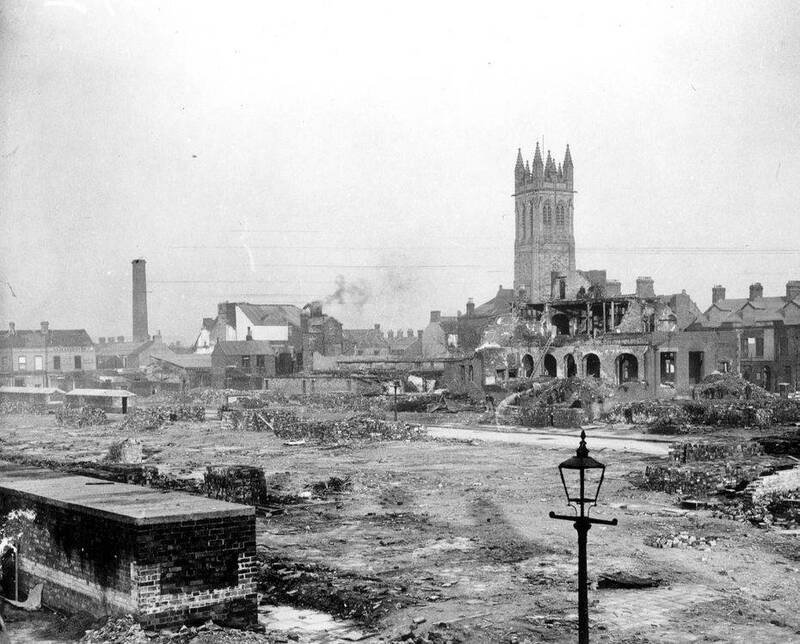 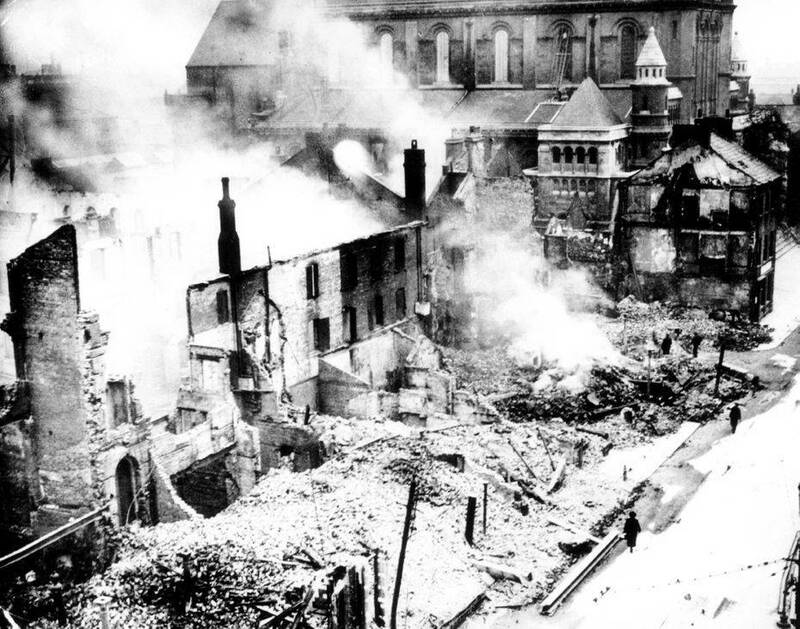 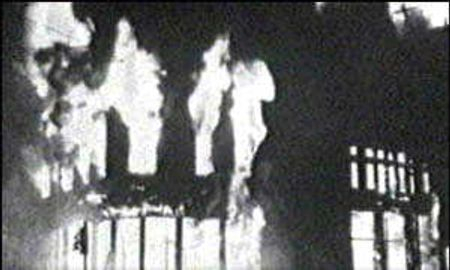 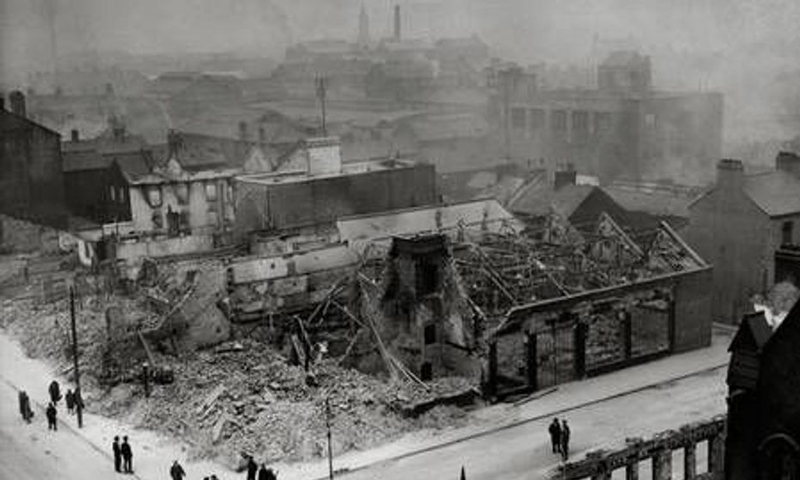 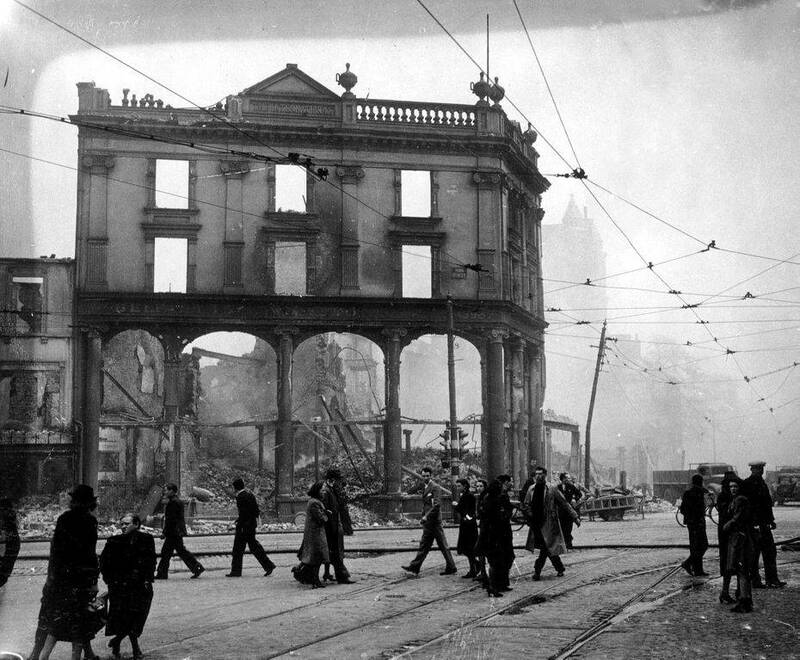 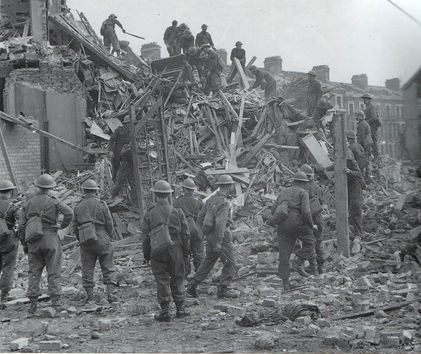 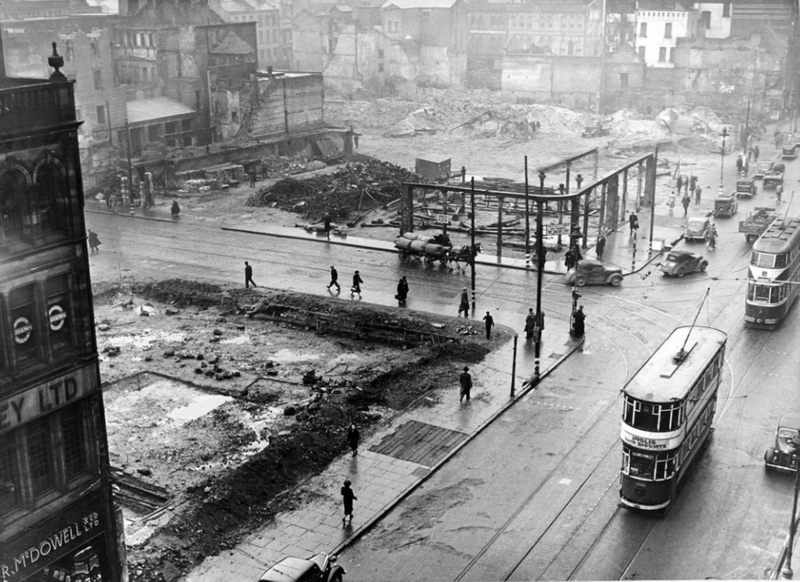 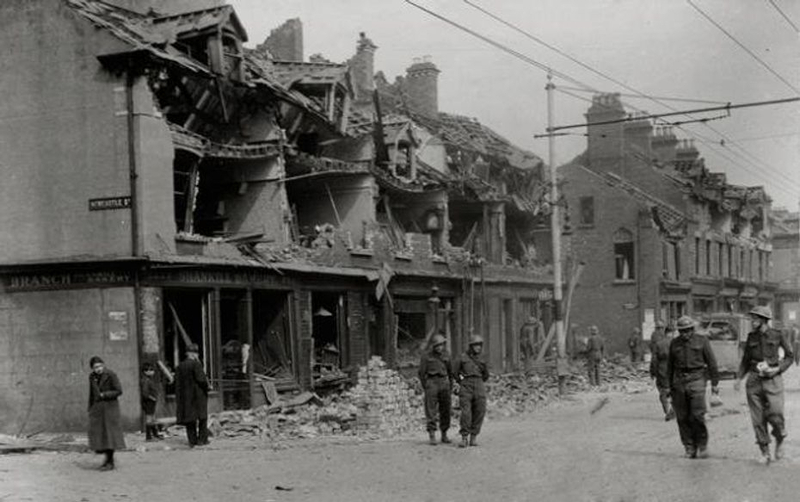 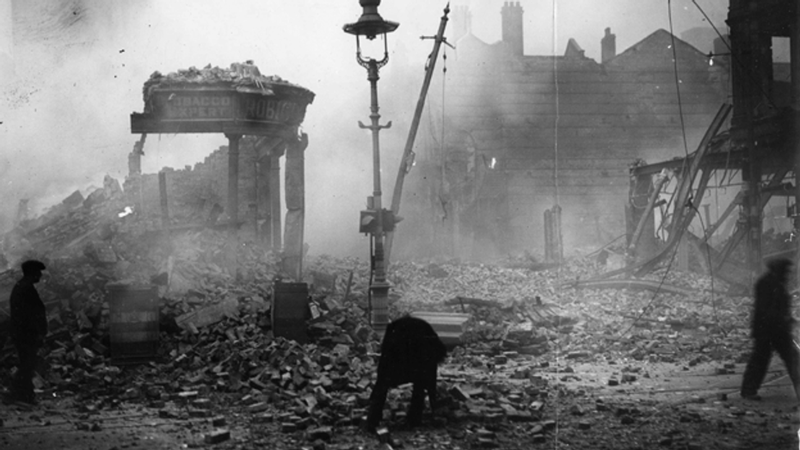 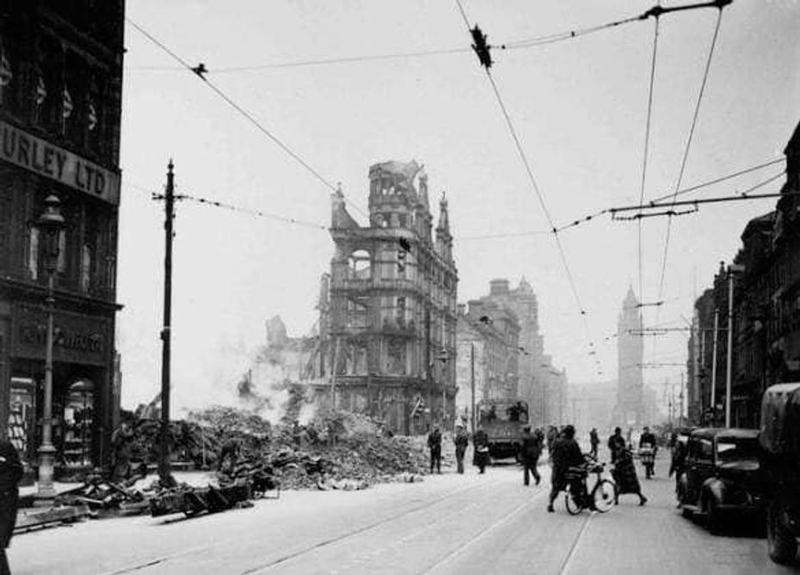 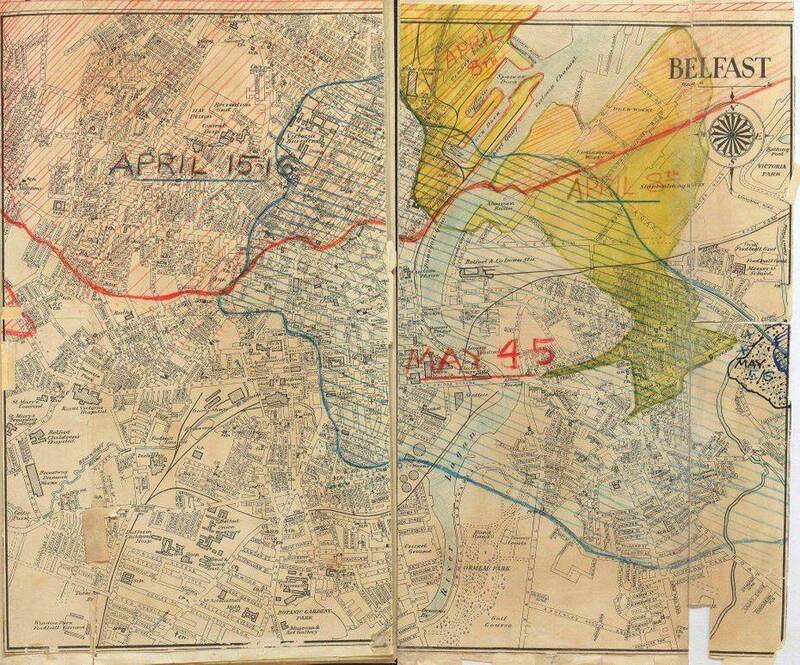 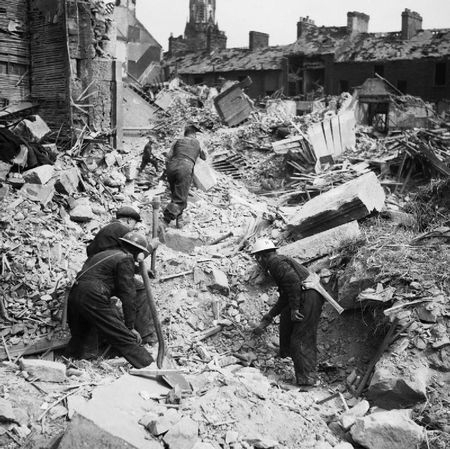 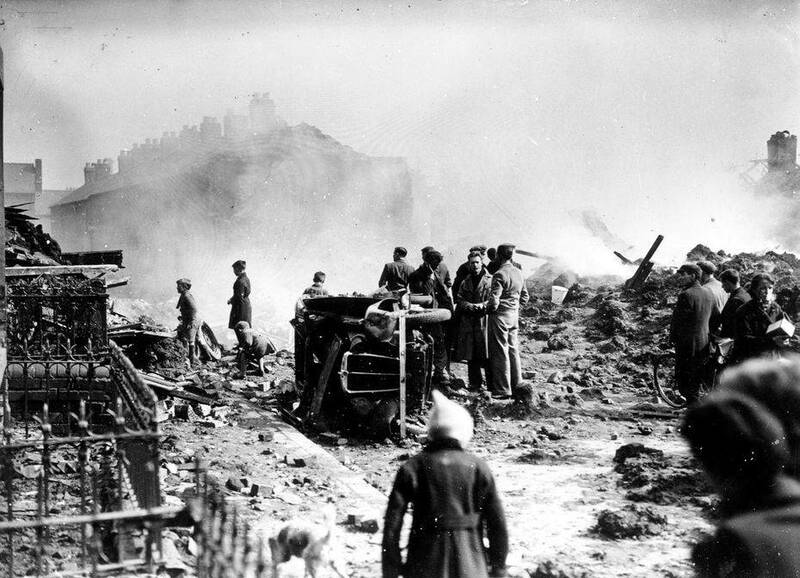 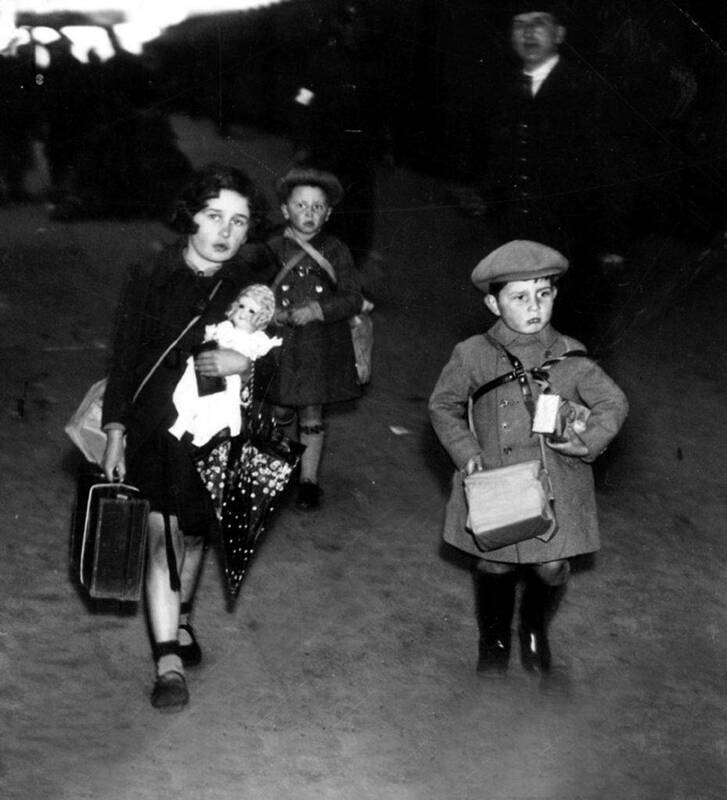 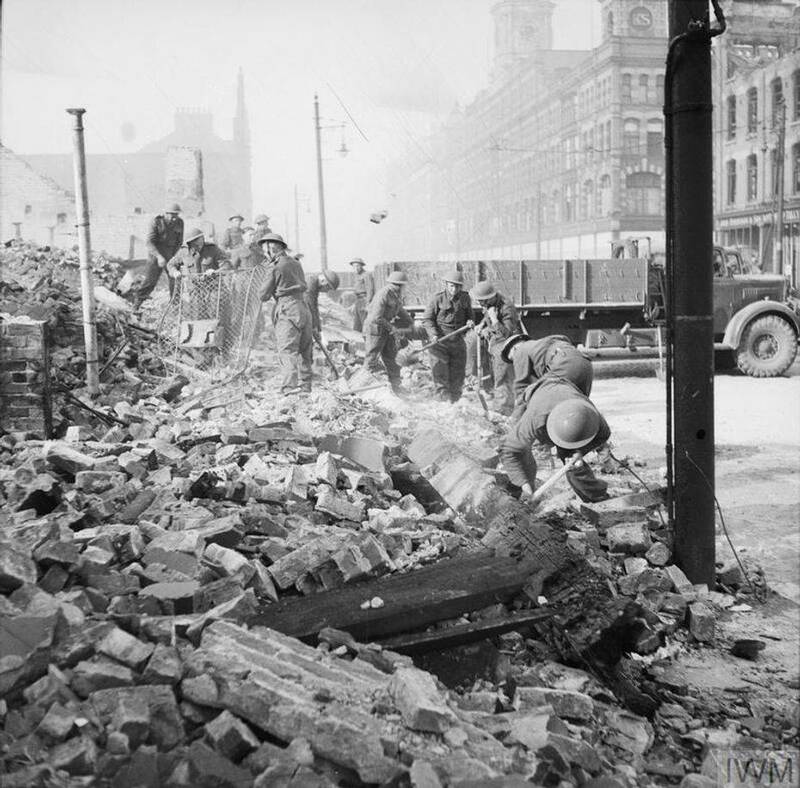 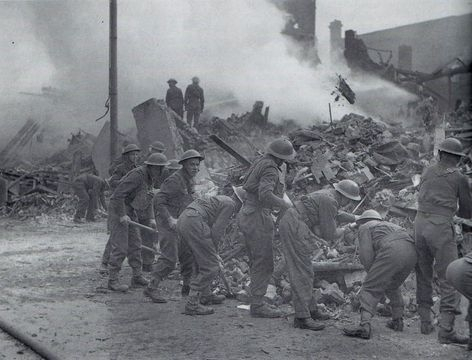 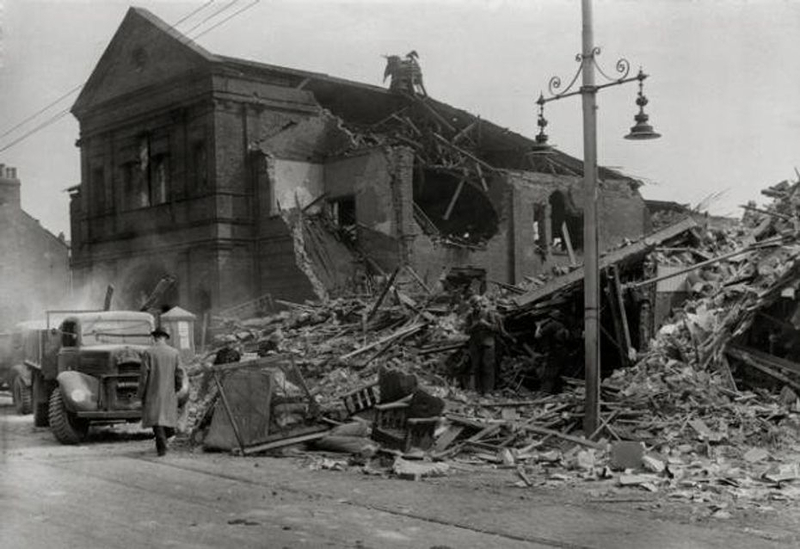 On the night of 7th/8th April 1941 German Bombers arrived over Belfast and after illuminating the city with Flares they dropped a mixture of both High Explosive and Incendiary Bombs which mainly landed within the Docks area. 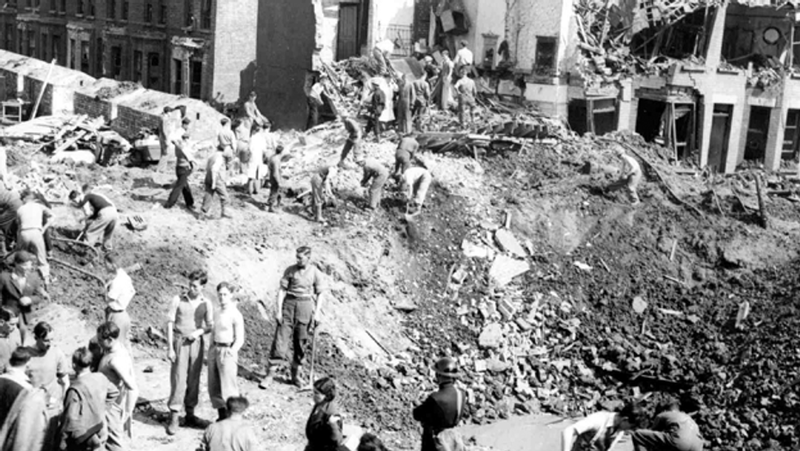 Both men were killed when a Parachute Mine exploded. 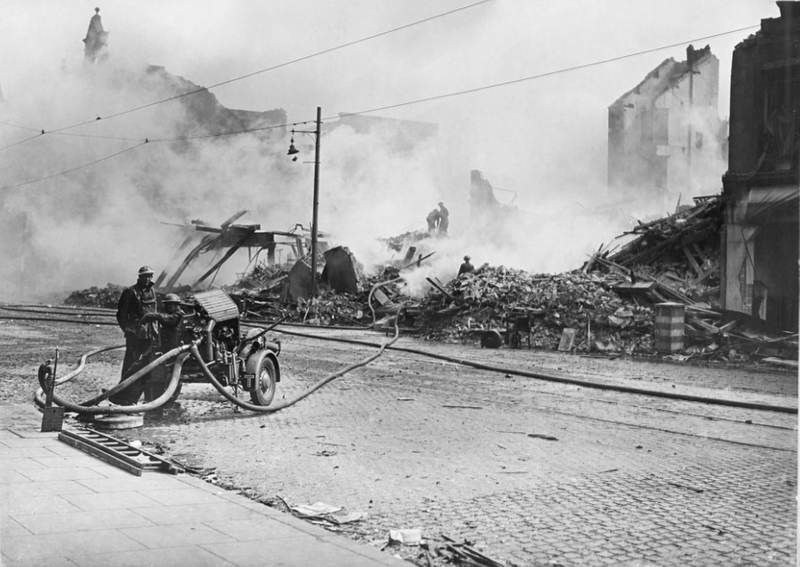 The wording on Archie McDonalds headstone says "Killed by enemy action attending a fire in Belfast Dock Area with Belfast Fire Brigade 8th April 1941"
Shown above is a Coventry Climax Water Pump being used in North Belfast and the other two photographs show a restored Coventry Climax Water Pump. 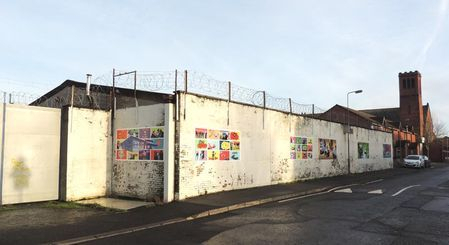 Strand Public Elementary School, Strandburn Street. 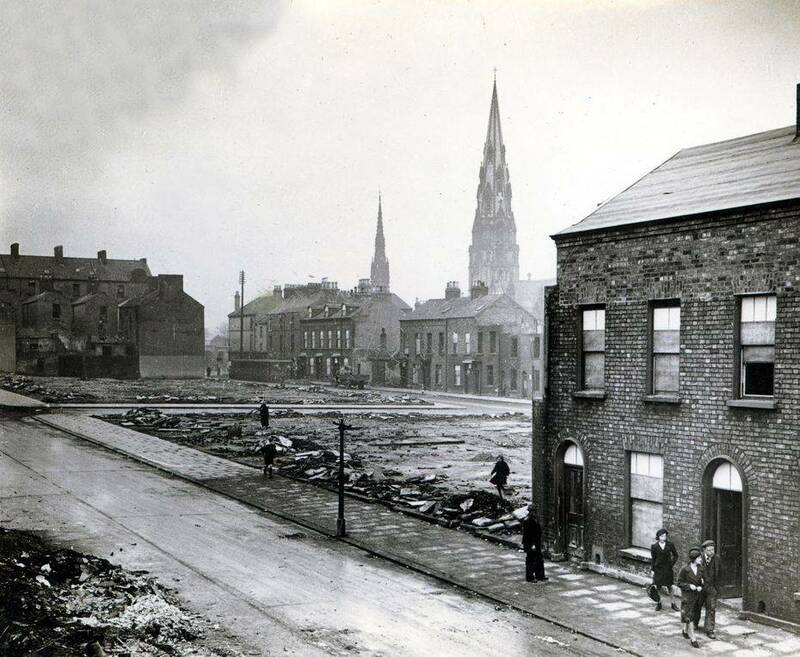 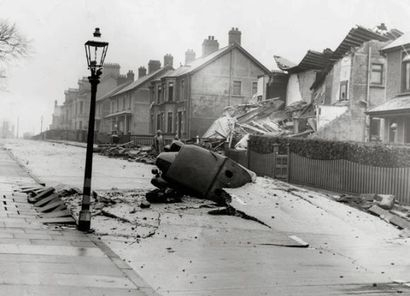 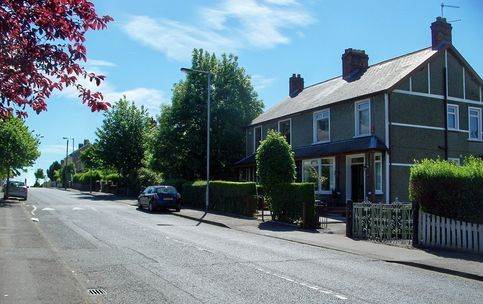 This photograph was taken from from Chobham Street across Ravenscroft Avenue and along Westcott Street towards Bloomfield Avenue. 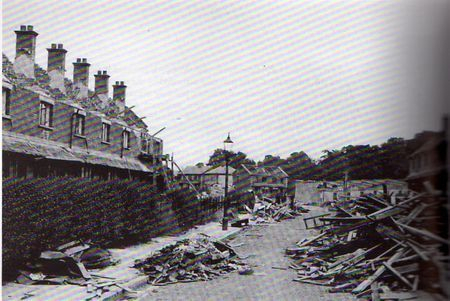 There have been some changes however the chimneys show the position. 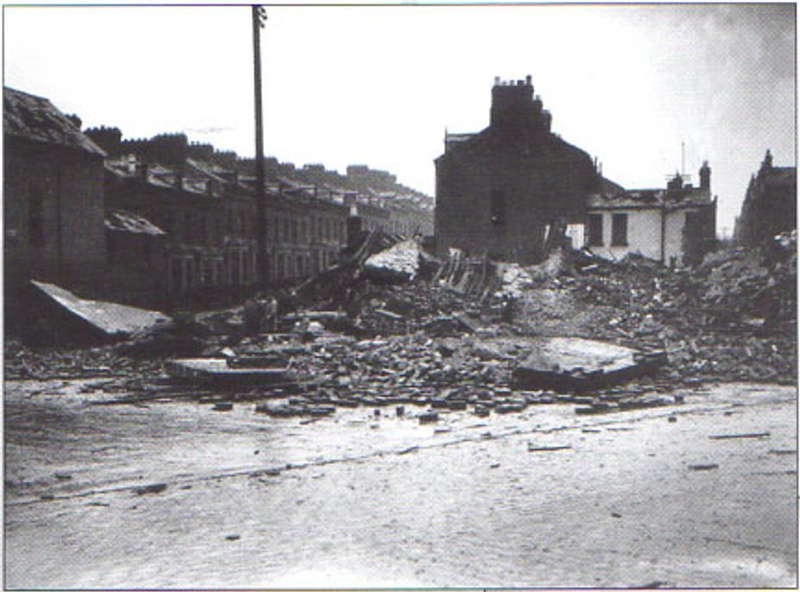 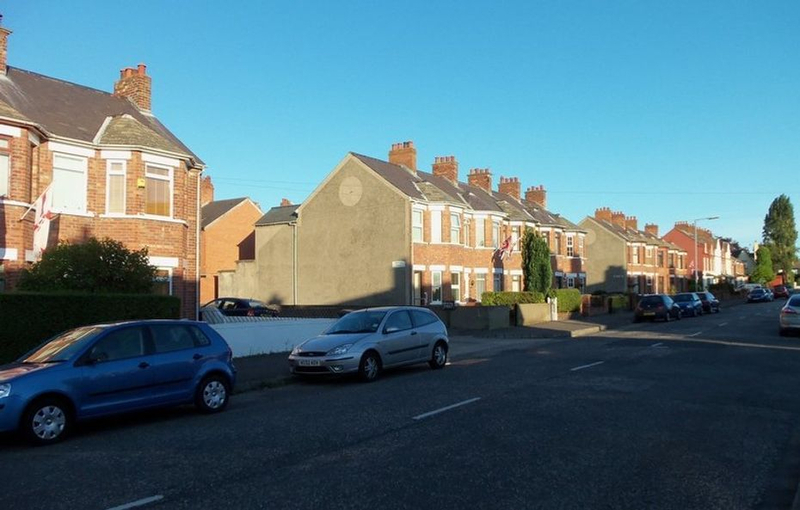 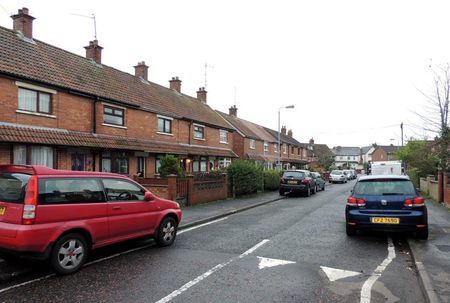 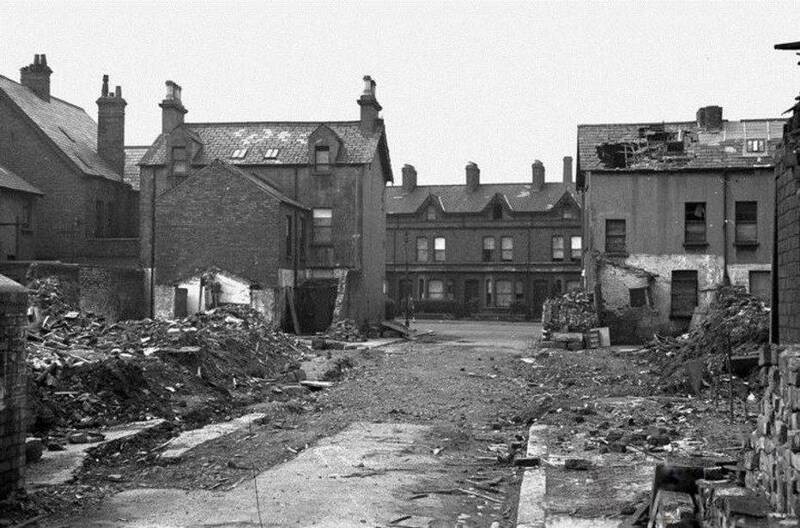 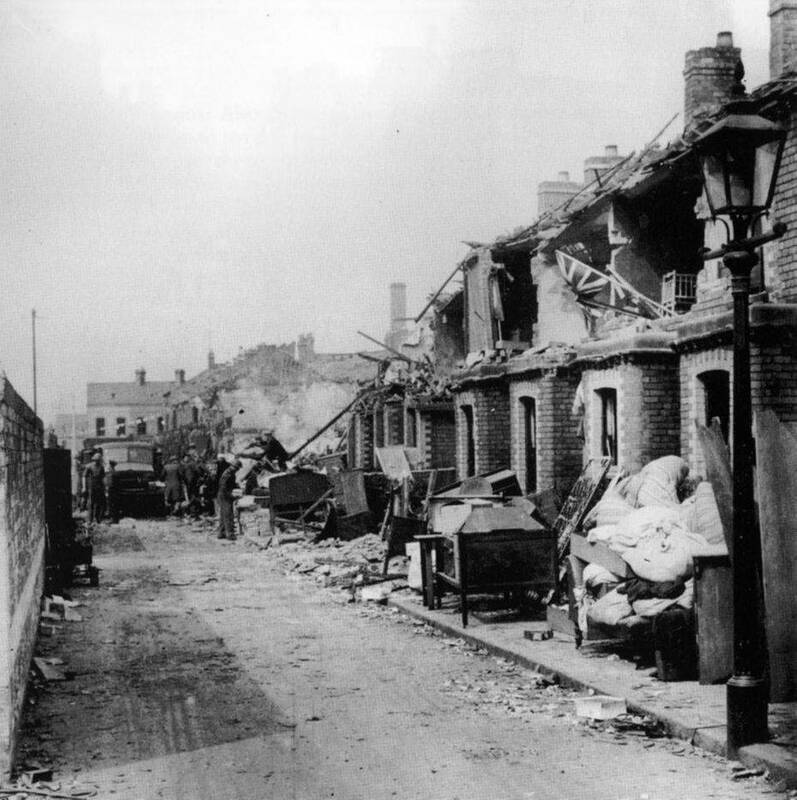 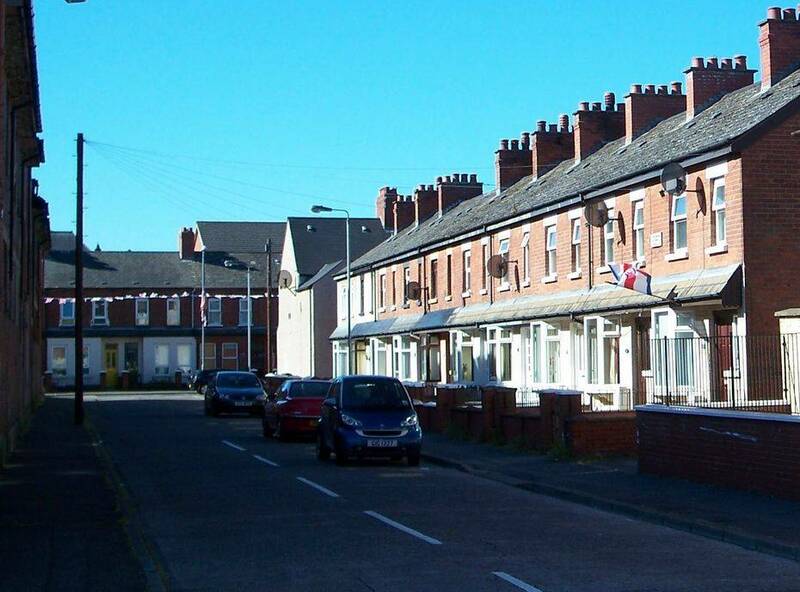 This is the scene in Avondale Street on 13th July 1941 and as it looks today. 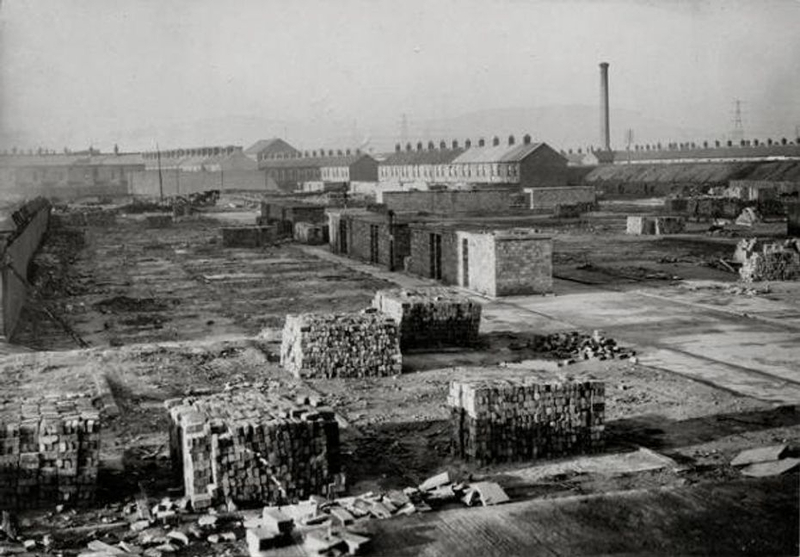 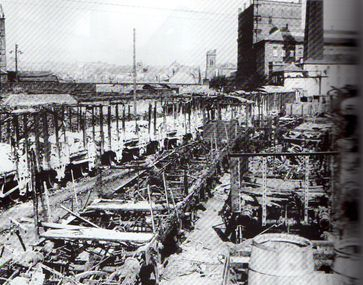 View of Abetta Parade and Hyndford Street at Beersbridge Road from the old Mill. 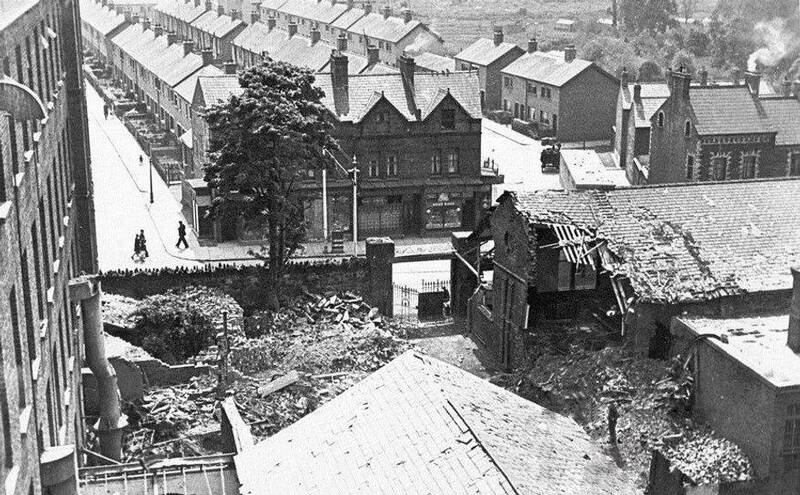 My two photographs here show the Bomb Damage scene at the old Mill from the opposite side of the road. 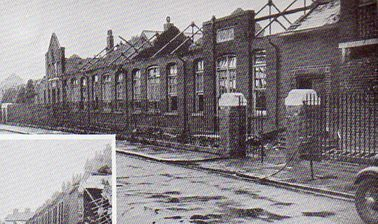 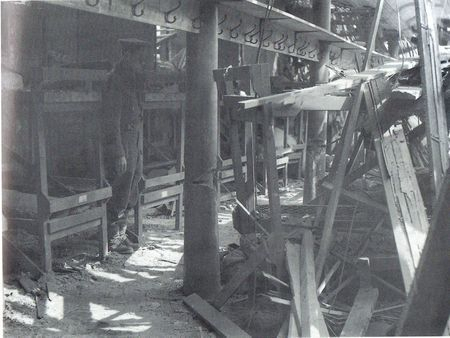 The first picture shows the entrance gate with the Mill to the right whilst the second picture shows the building which sustained considerable roof damage. 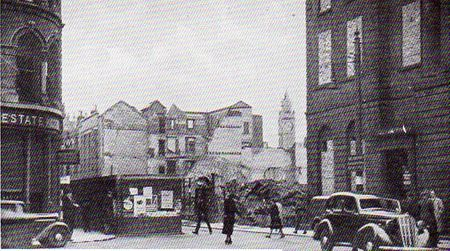 The large red bricked building on the right was part of the large Co-Operative store for many years and is now part of a University complex. 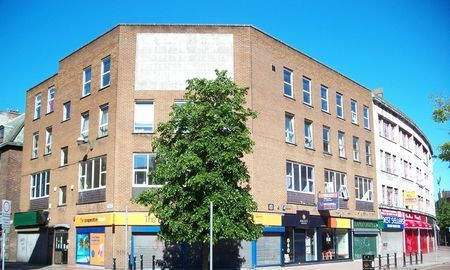 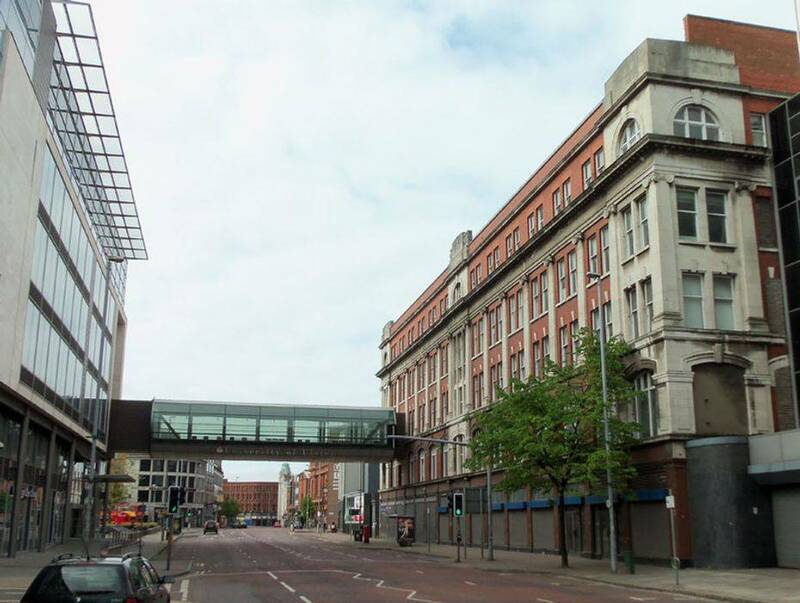 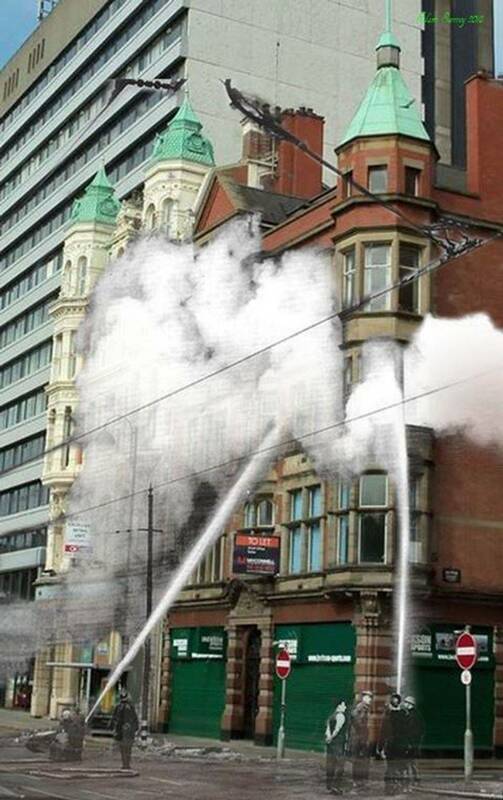 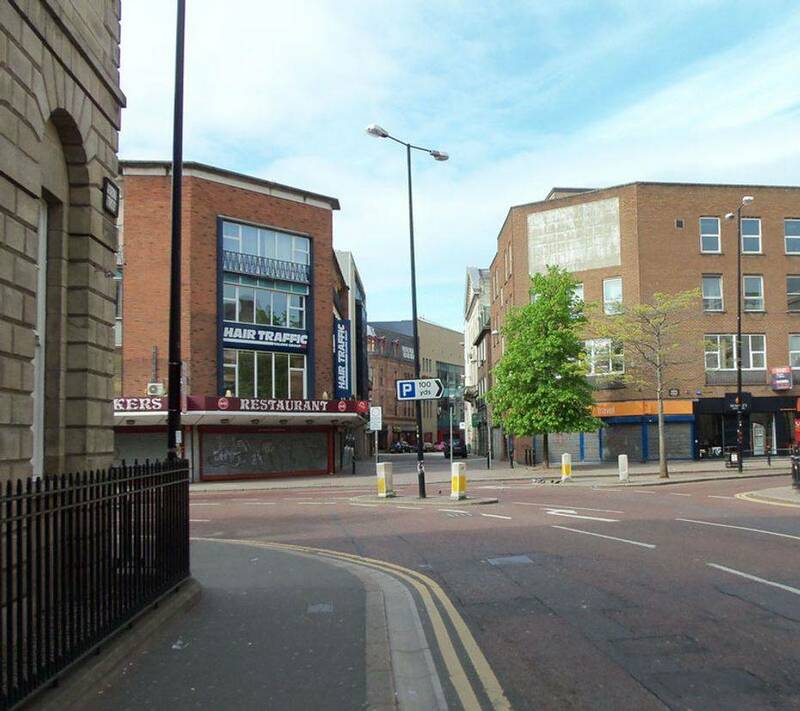 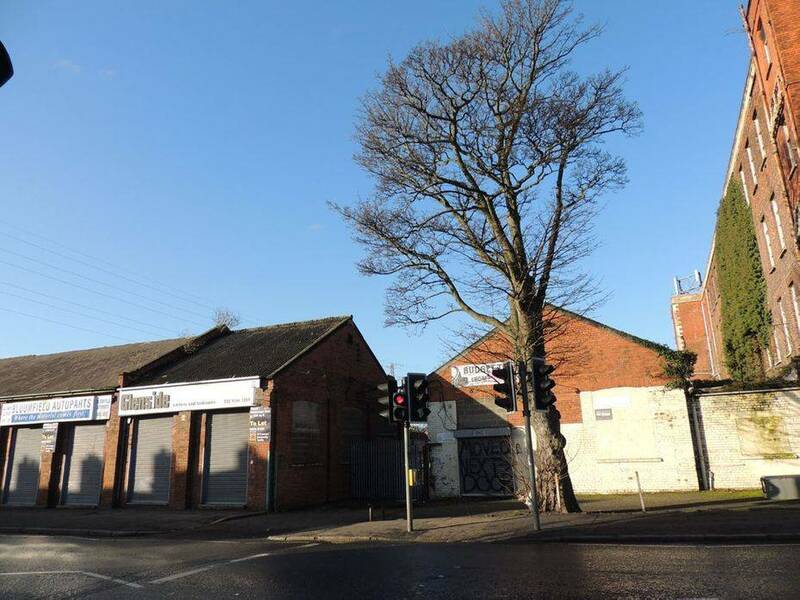 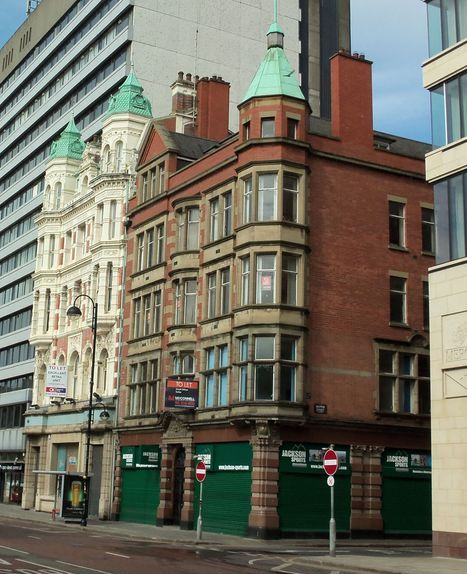 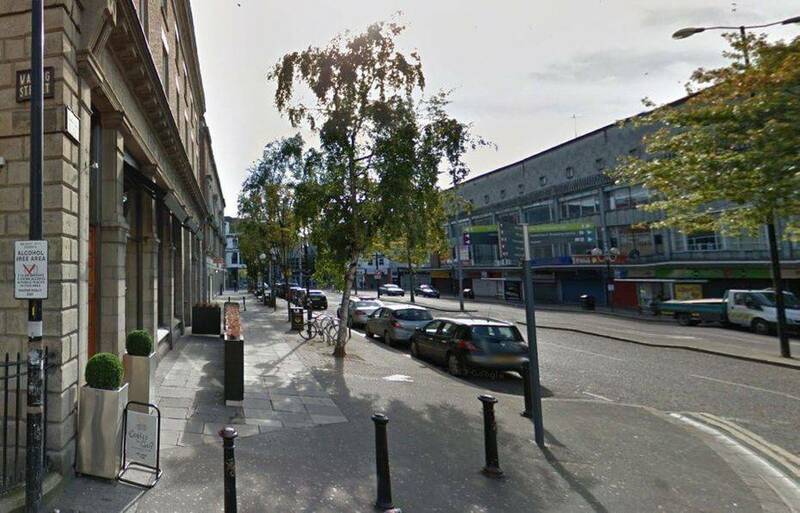 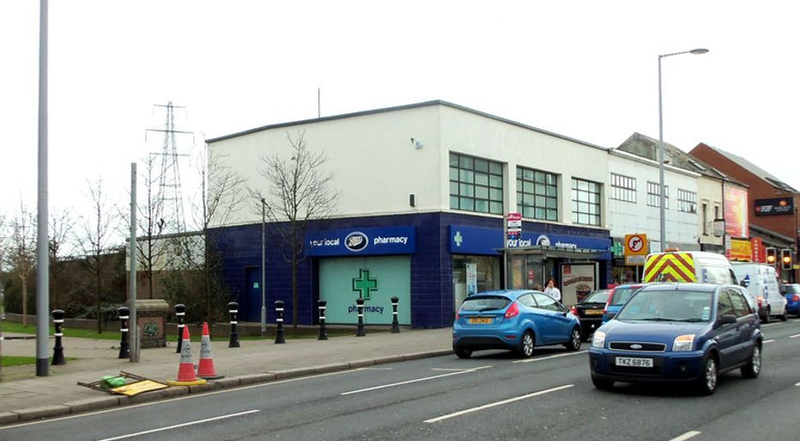 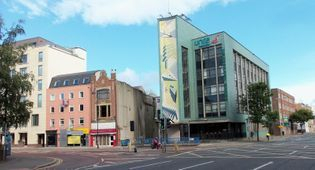 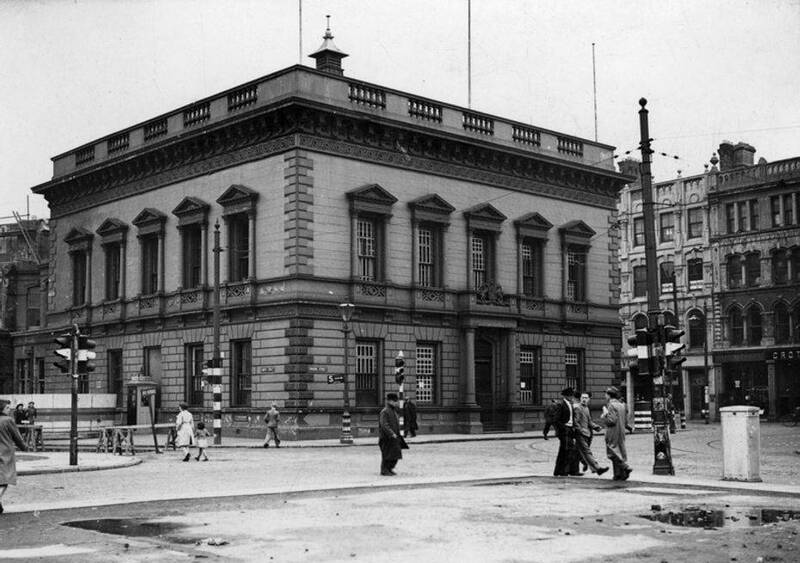 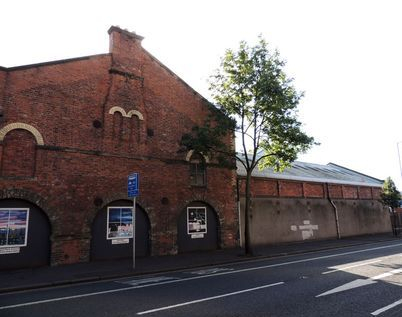 These two photographs of the same building are from the Belfast Telegraph. 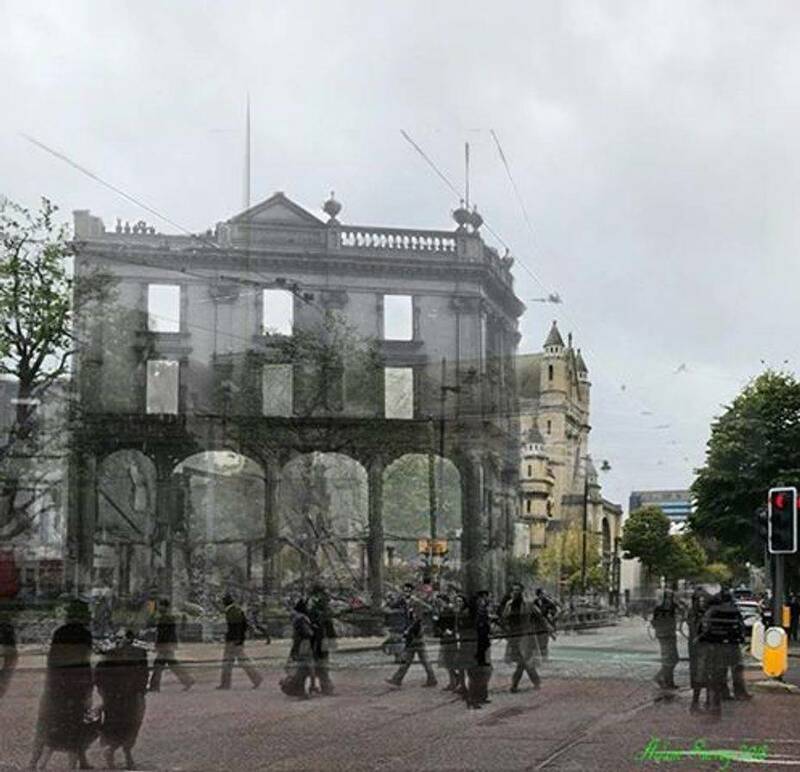 In this picture you can see where the house which was destroyed by bombing has been replaced. 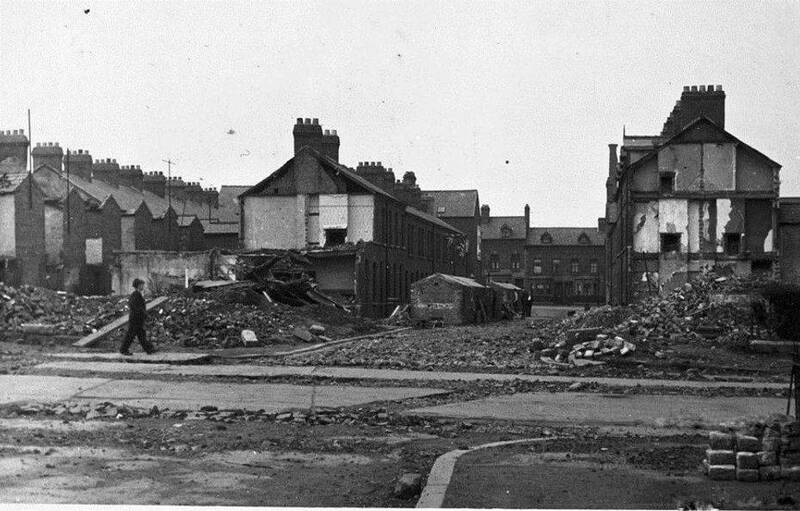 In todays photograph all that remains are the towers of the background building. 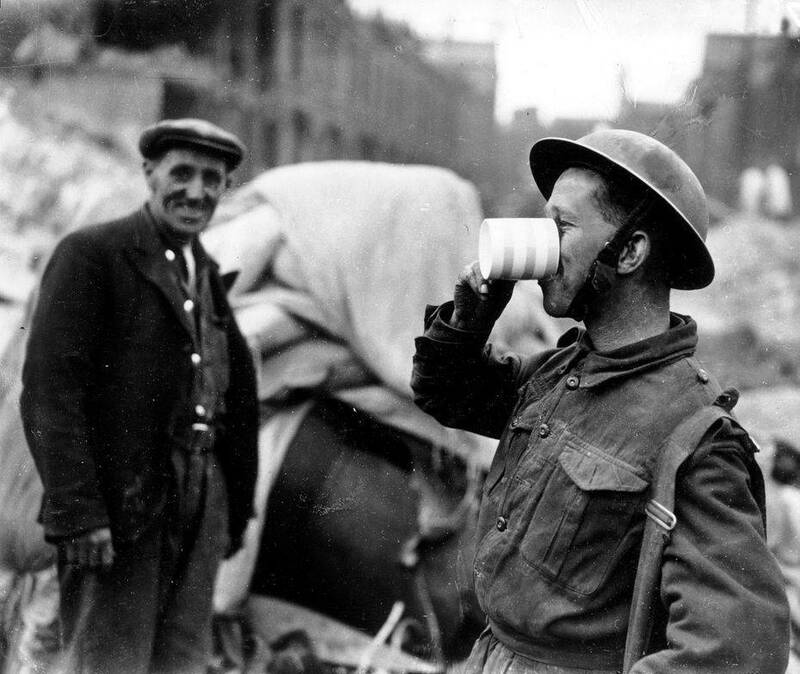 Time for a well earned cup of tea. 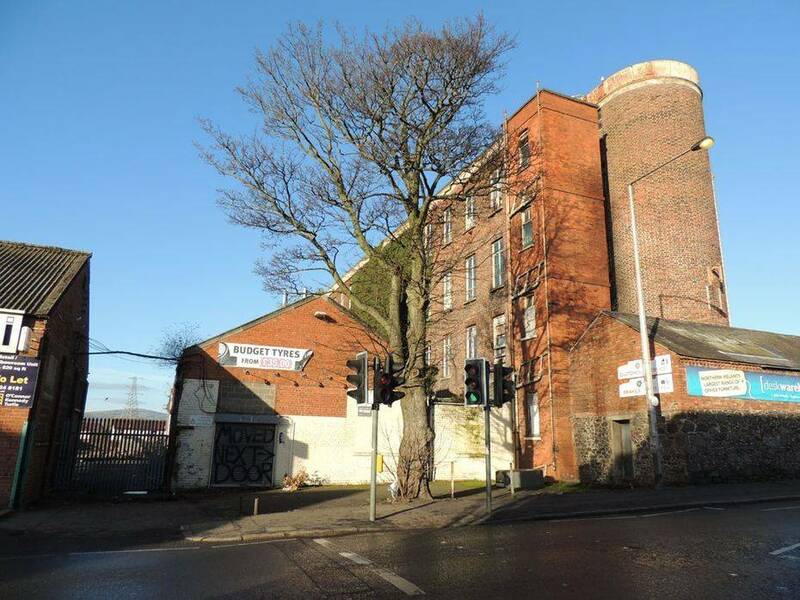 Thankfully the old red bricked Mill complete with tall chimney and the church in the background remain to ensure a good comparison here. 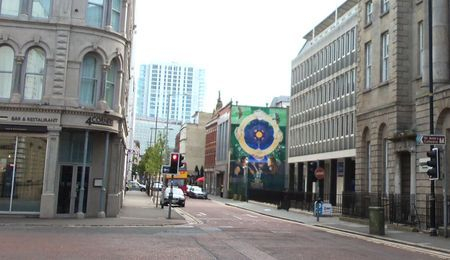 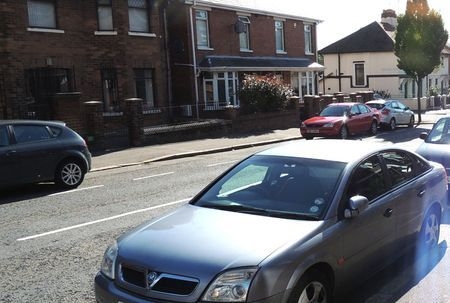 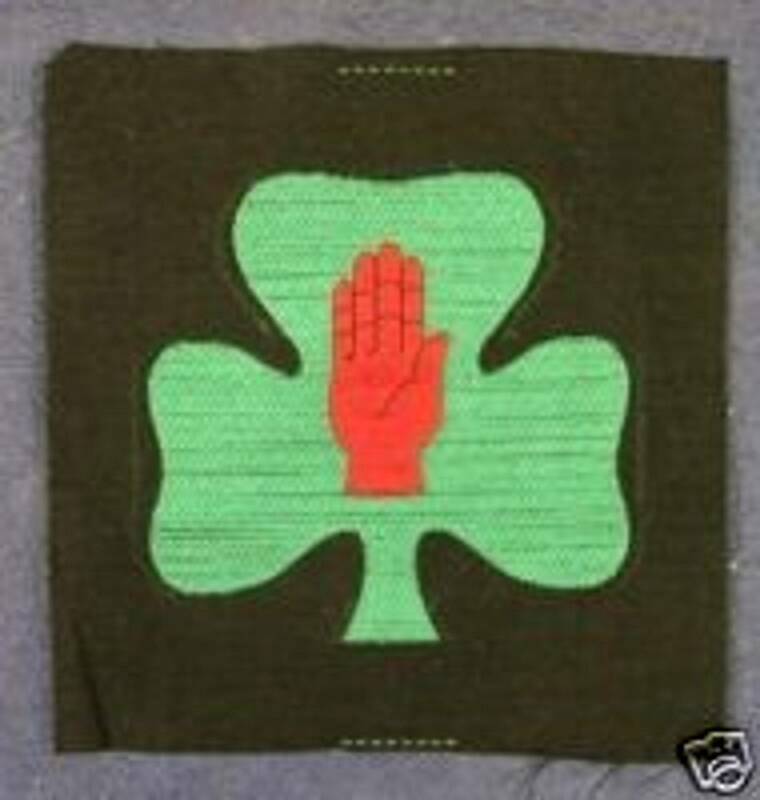 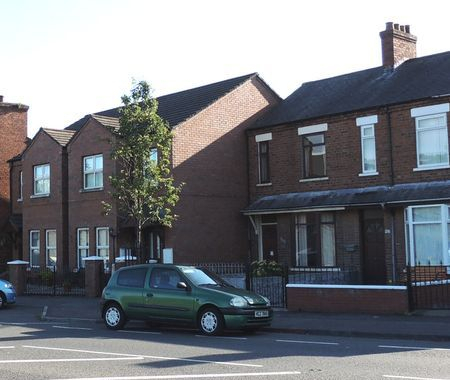 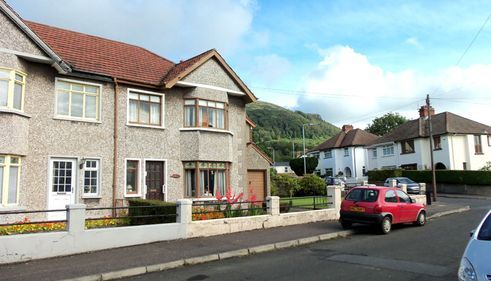 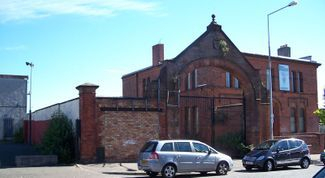 This is where the Royal Ulster Rifles Museum is located and I would recommend a visit! 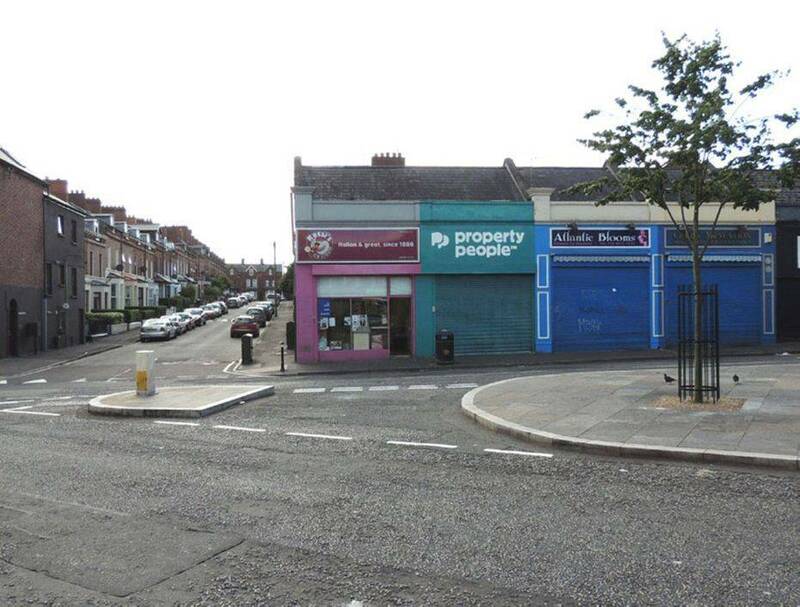 Virtually unrecognisable from the first picture. 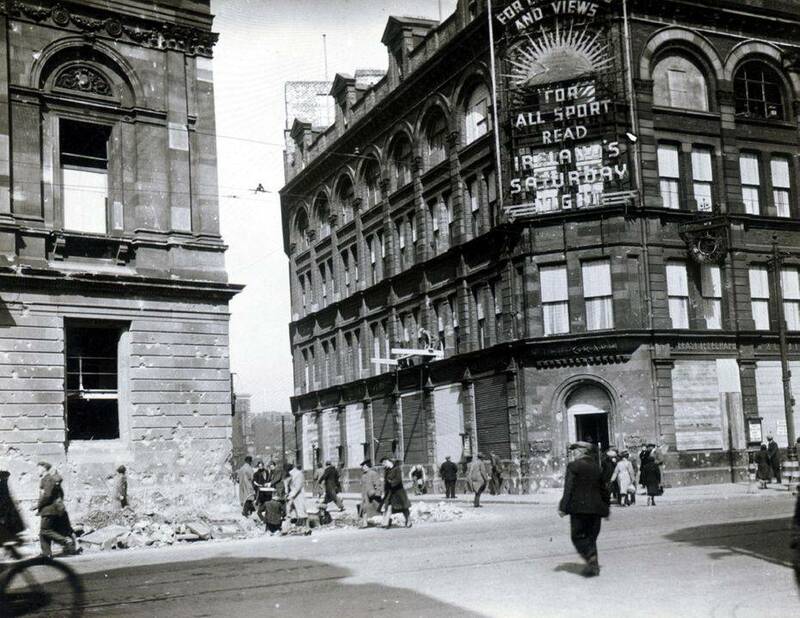 All that is clearly identifiable is the railing around the Northern Whig building on the left side. 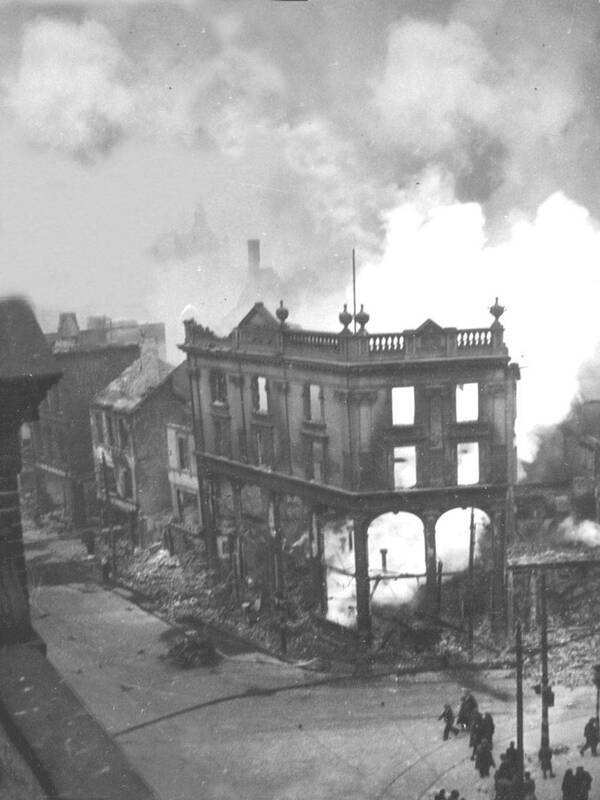 The large old building on the right is the one which is shown in flames in the Rosemary Street / Lower North Street picture below. 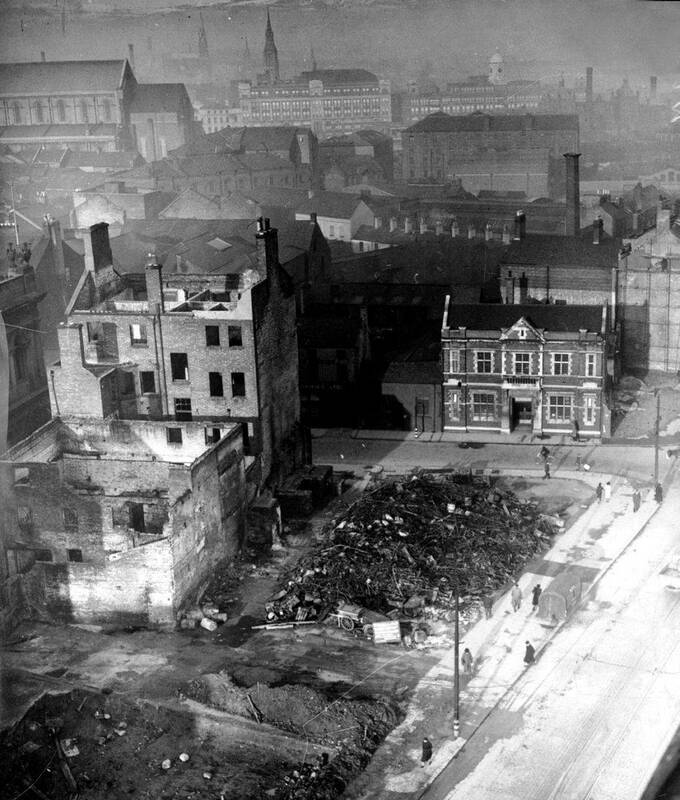 Due to the considerable destruction in this area only the Northern Whig building on the left of the pictures remains following the raid. 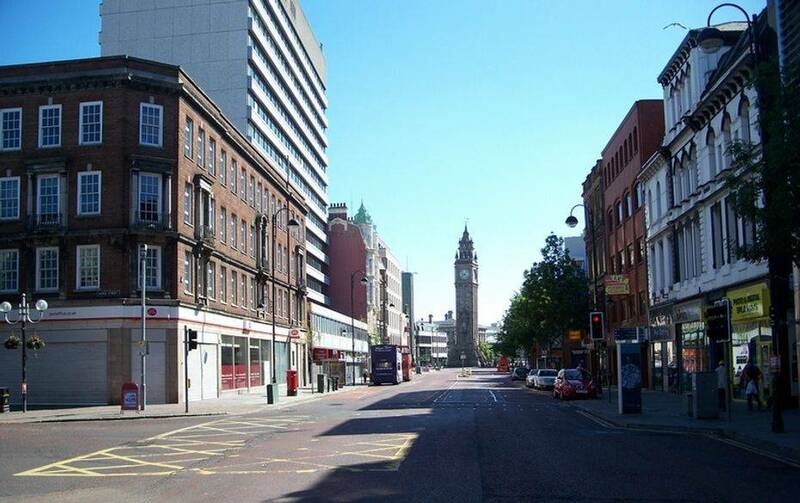 The photographs below show the same Street before and after the Bombers as well as how it looks now. 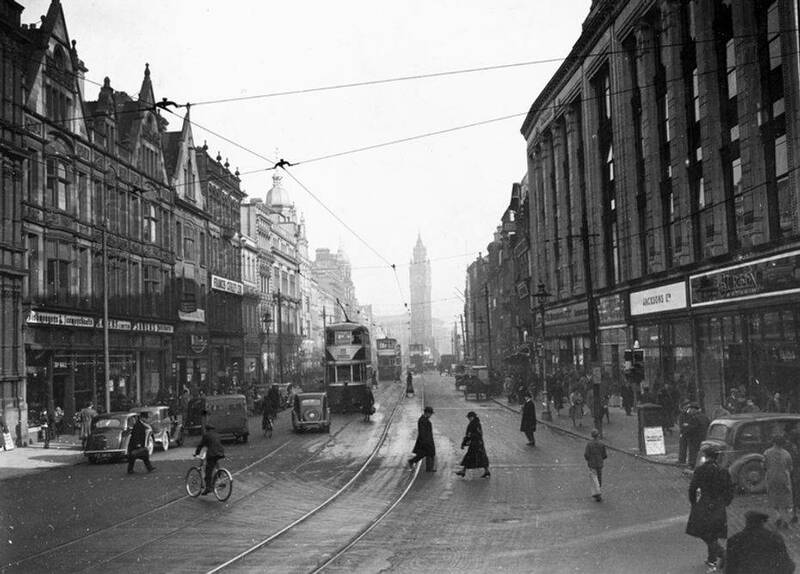 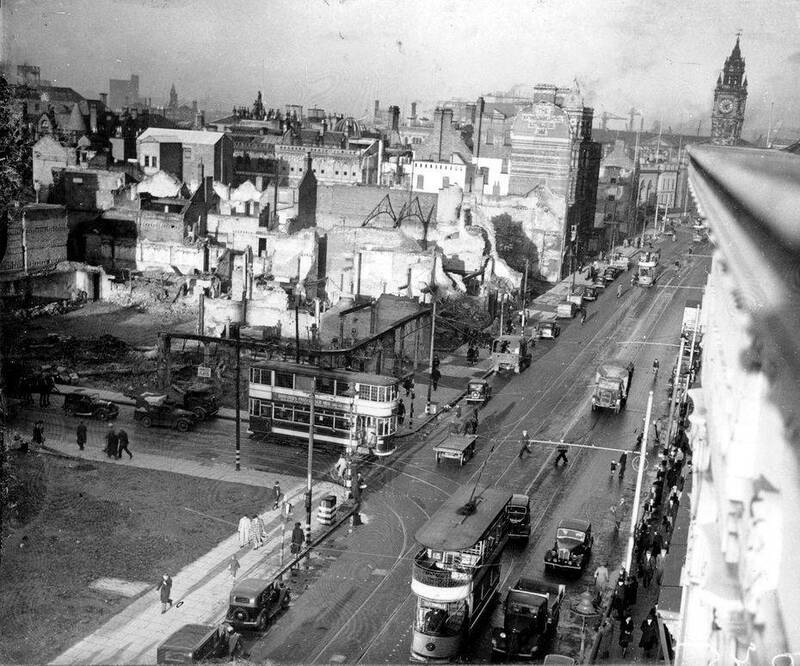 The pictures above are looking towards High Street from Victoria Street. 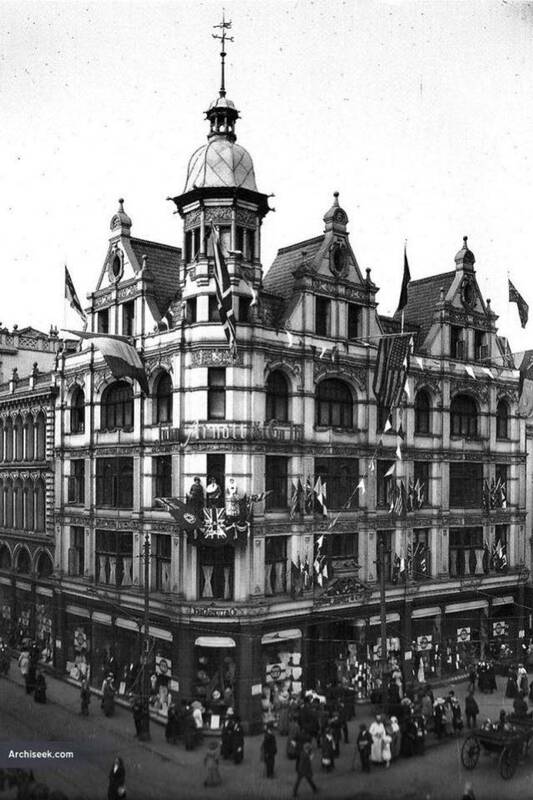 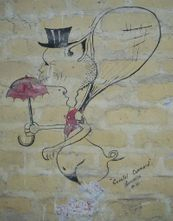 It is easy to see the building I have used in my comparrison photograph. 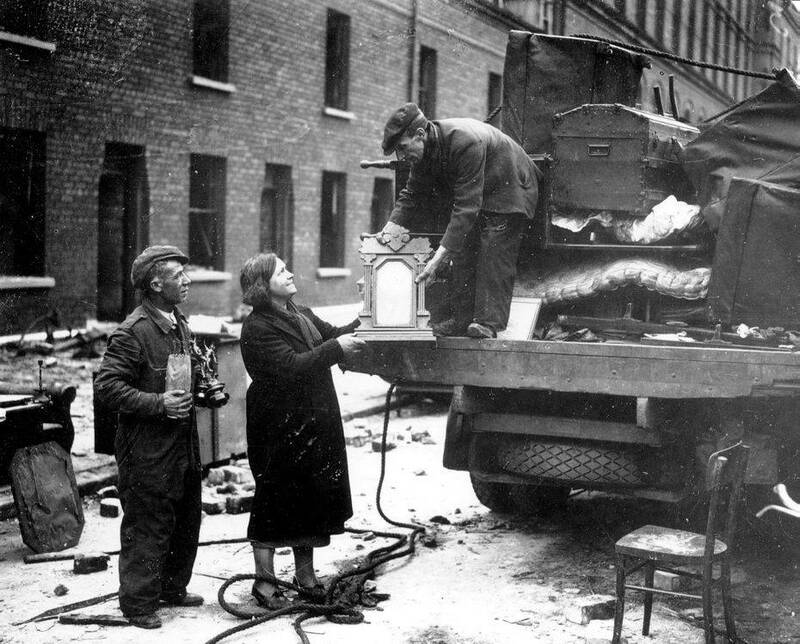 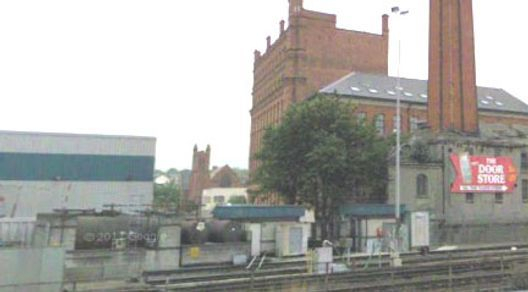 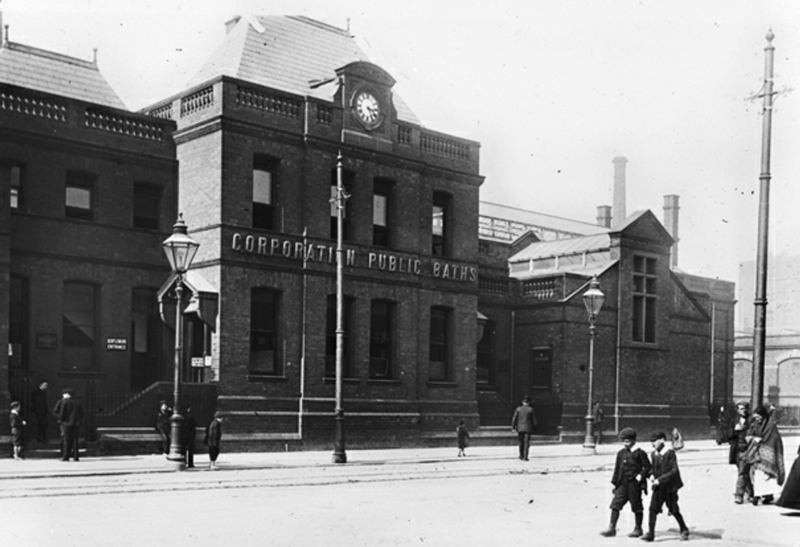 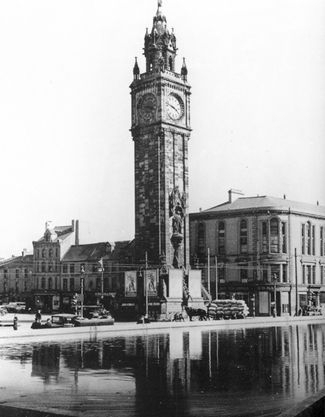 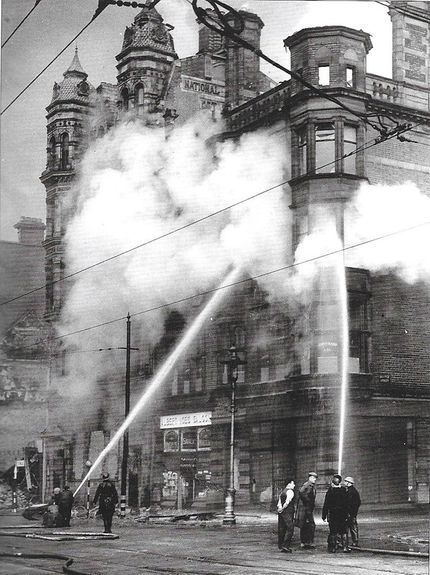 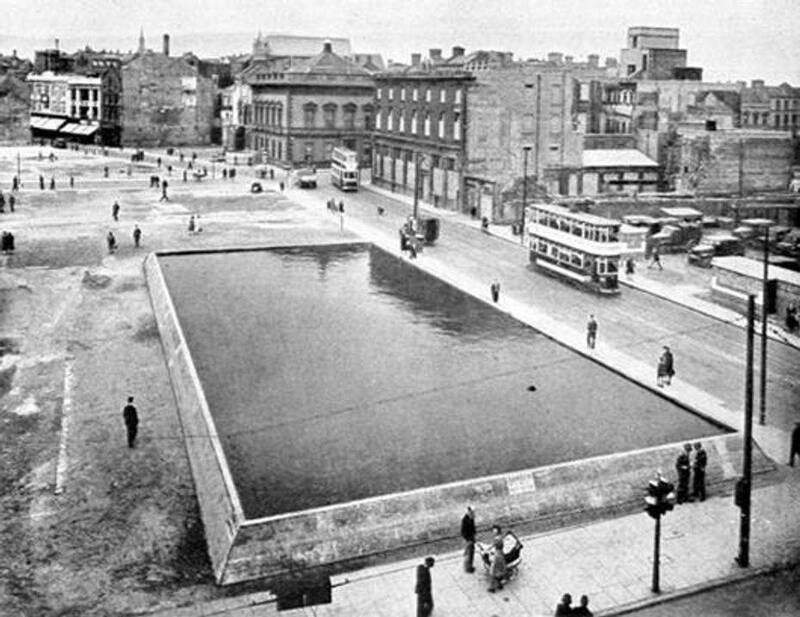 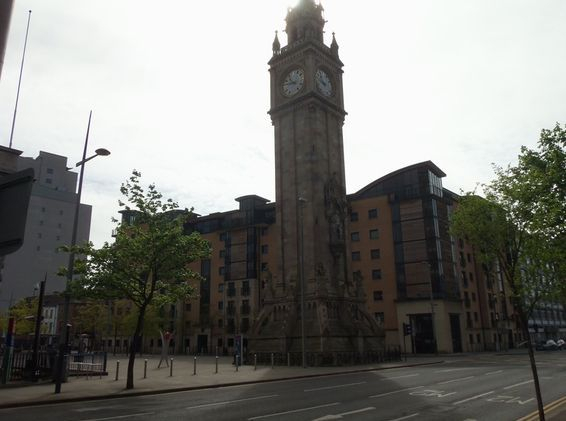 In front of the Albert Clock can be seen one of the large Water Tanks which could be seen distributed around the City of Belfast to assist in fire fighting following any Bombing Raids. 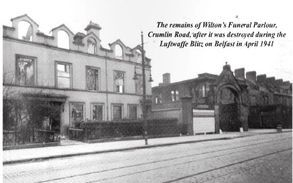 This is Wilton's Fineral Parlour on Crumlin Road which was destroyed during the Blitz. 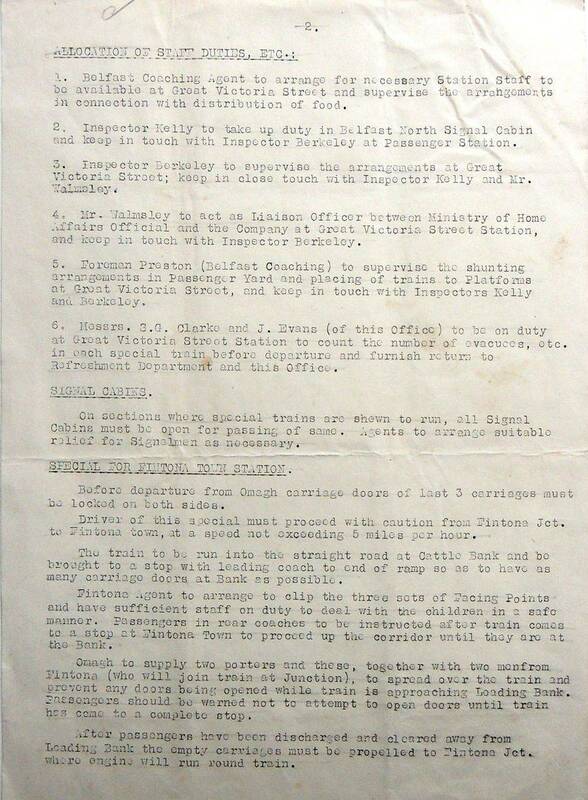 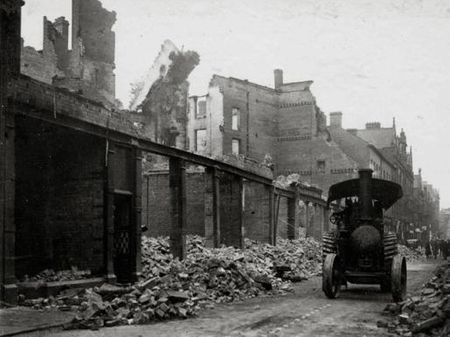 Sadly a number of Black Horses which were kept by the Company died in the Bombing. 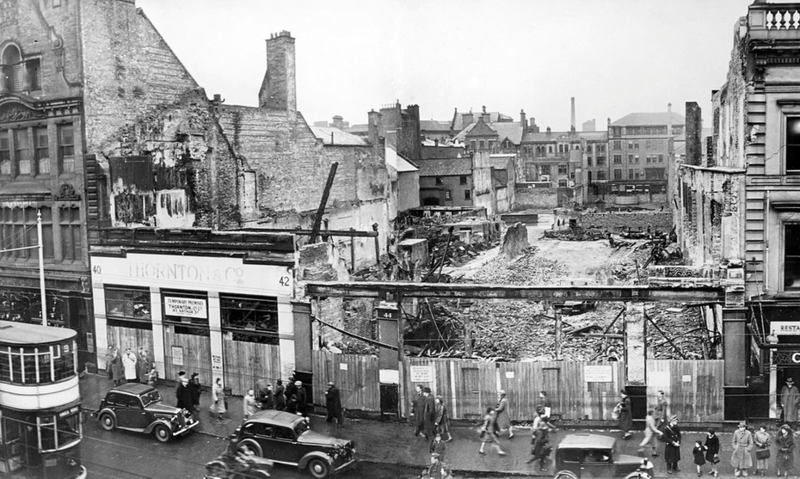 My photograph shows the archway which is all that remains. 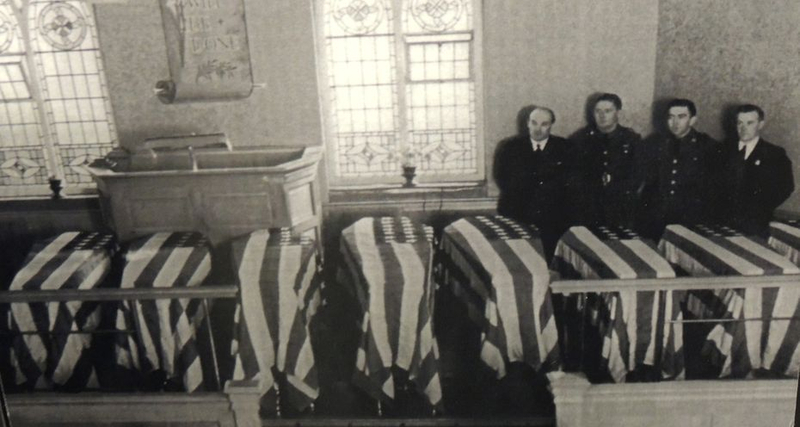 Shown above are the coffins of American Airmen lying in Wiltons Funeral Home before burial at Lisnabreeny. 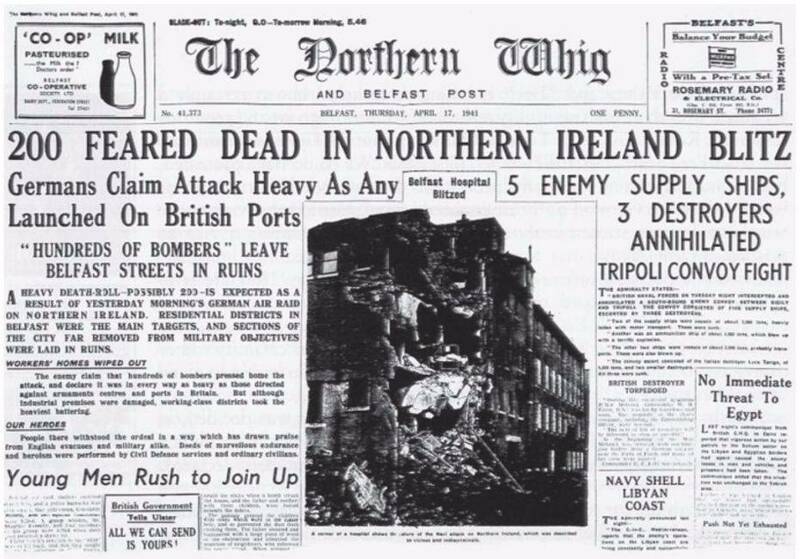 The picture on the left is from the Belfast Telegraph. 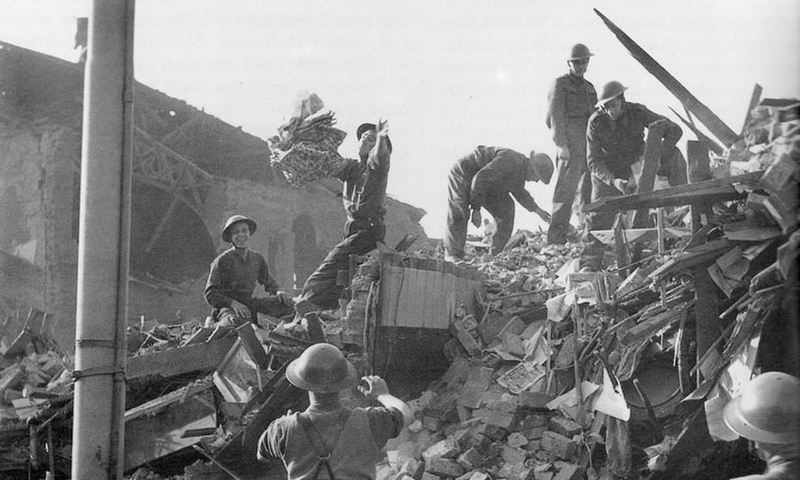 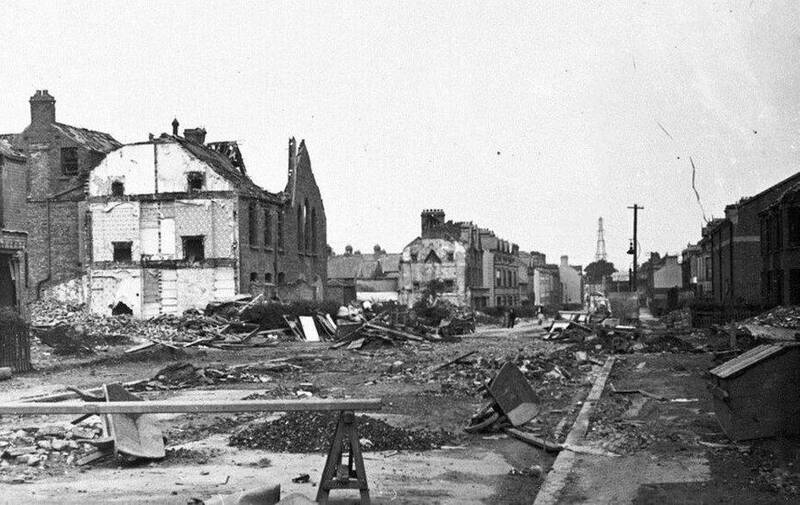 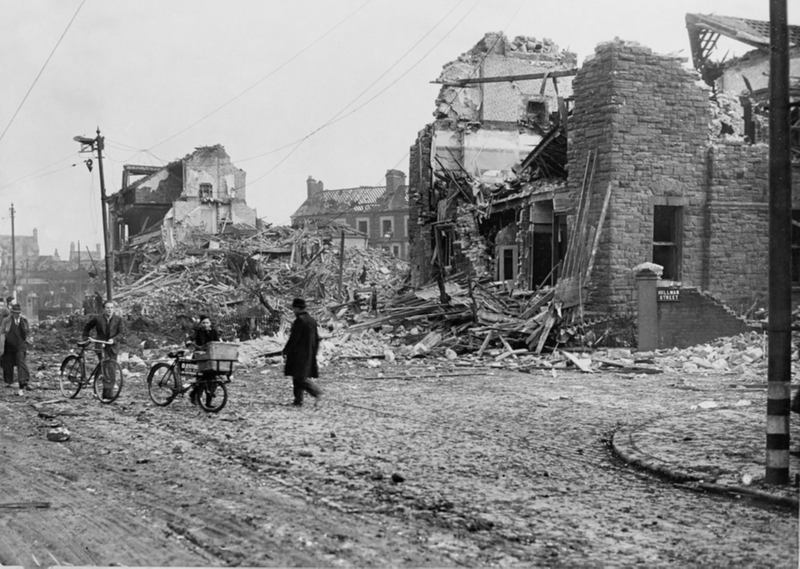 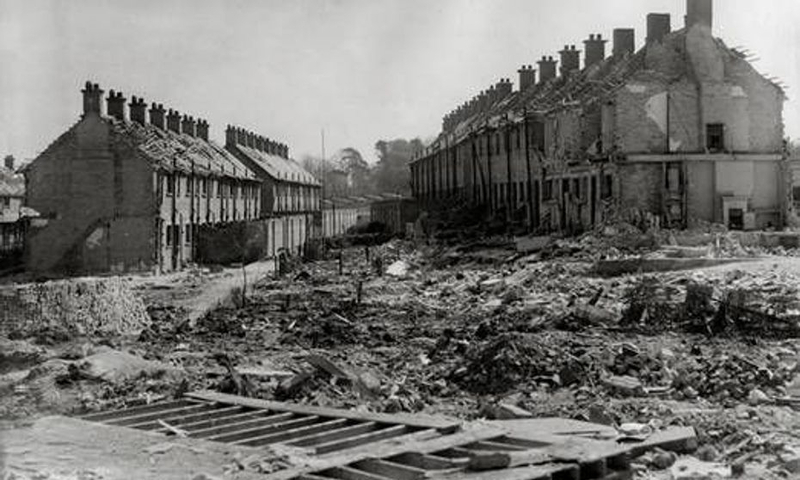 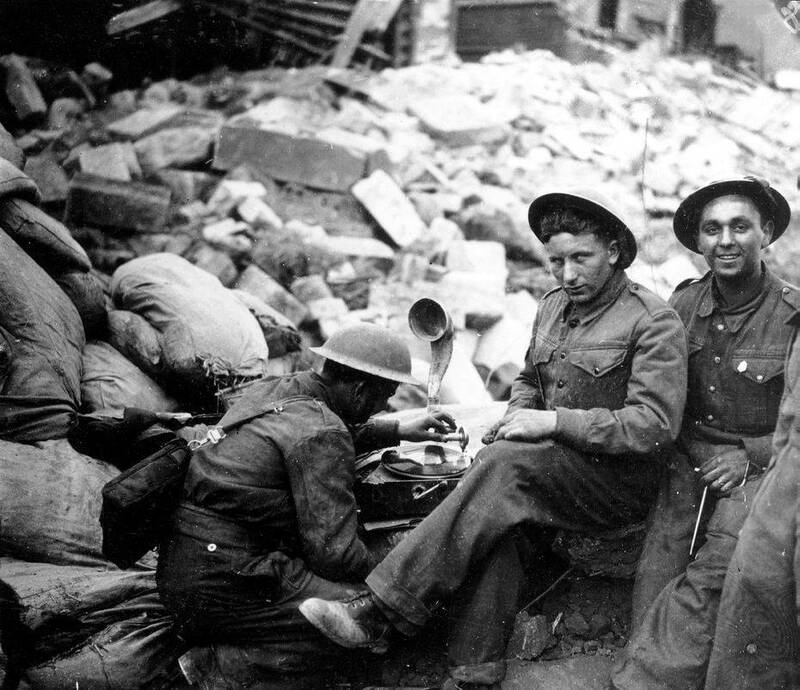 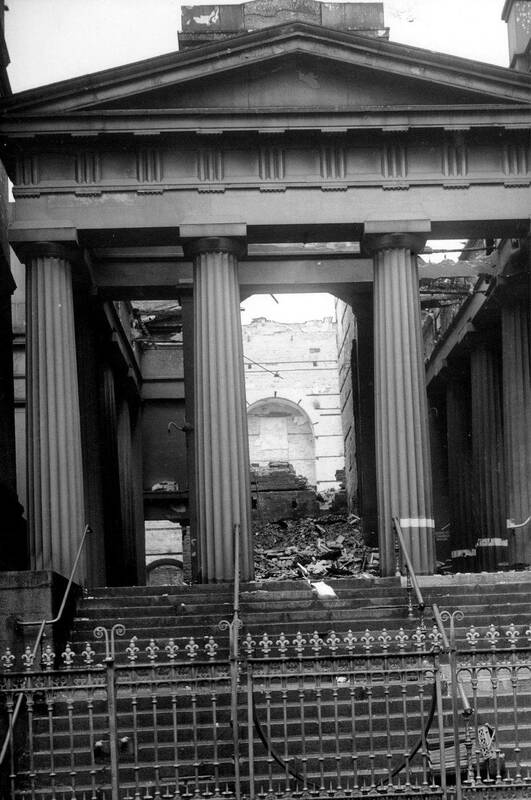 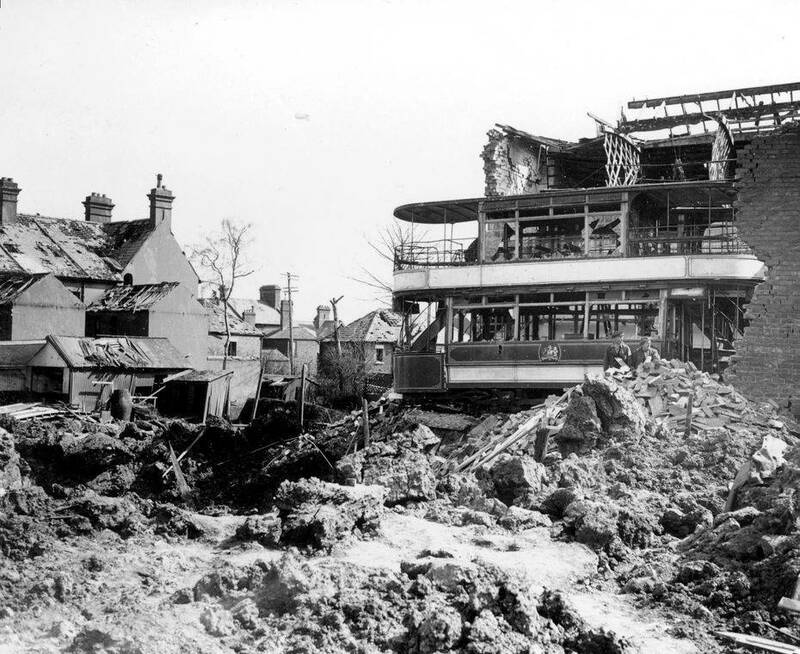 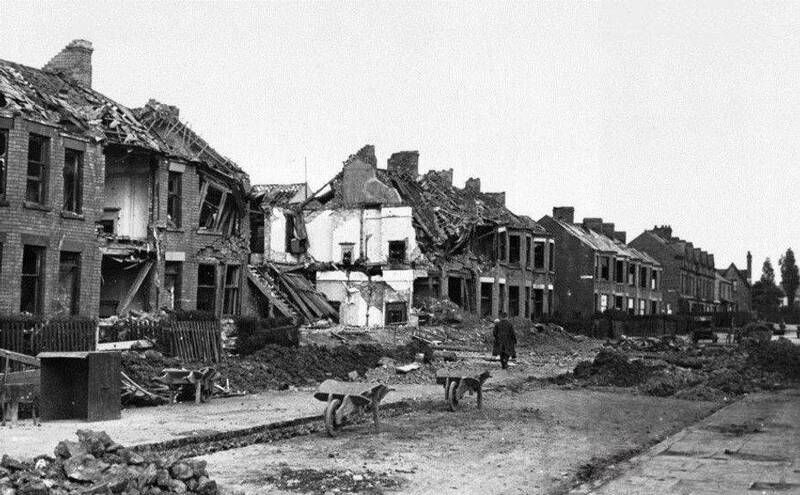 A Soldier surveys the damage in Eglinton Public Elementary School which had been used as a Billet by soldiers from 173 Pioneer Company while below shows the devastation in Eglinton Street in May 1941. 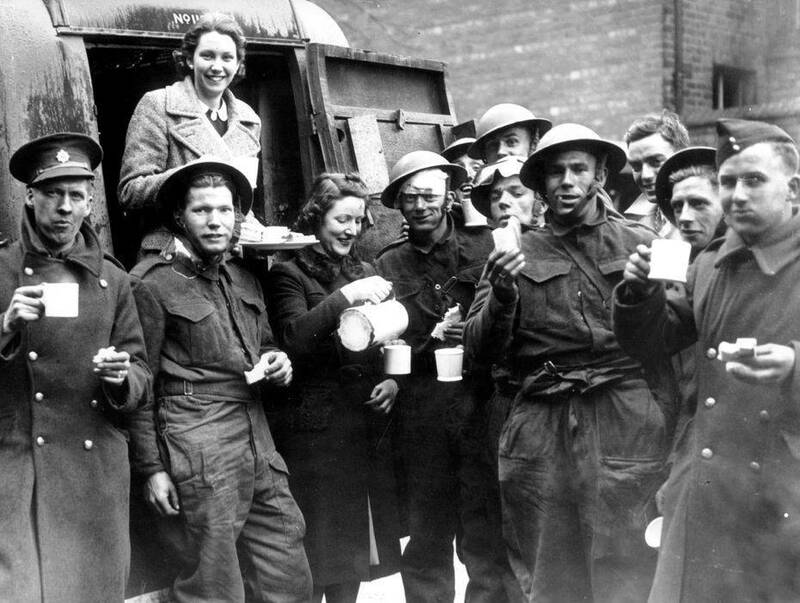 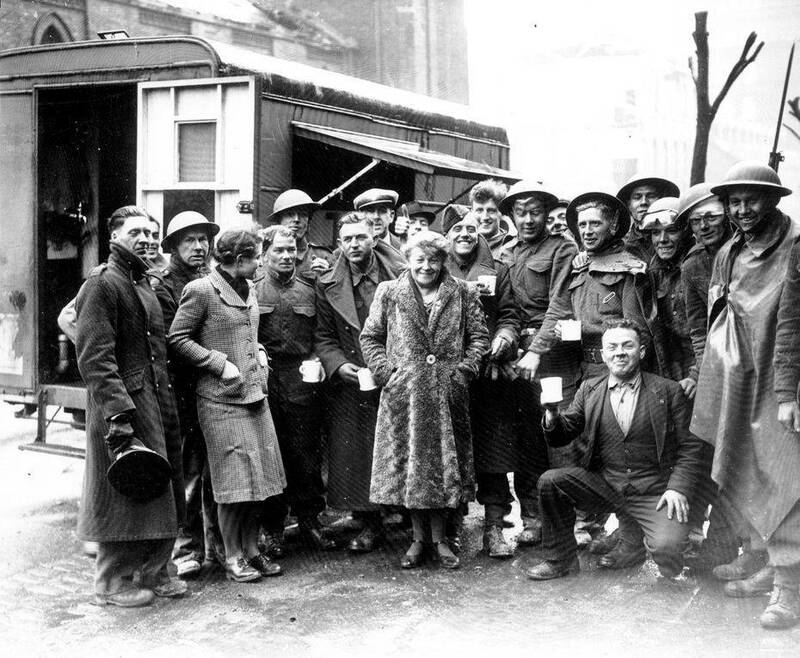 Photographs of Soldiers trying to make the most of things and enjoying a Cup of Tea. 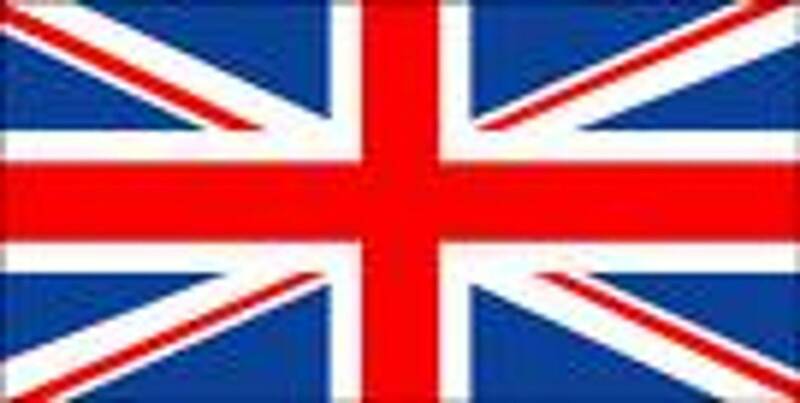 Ours or Theirs? 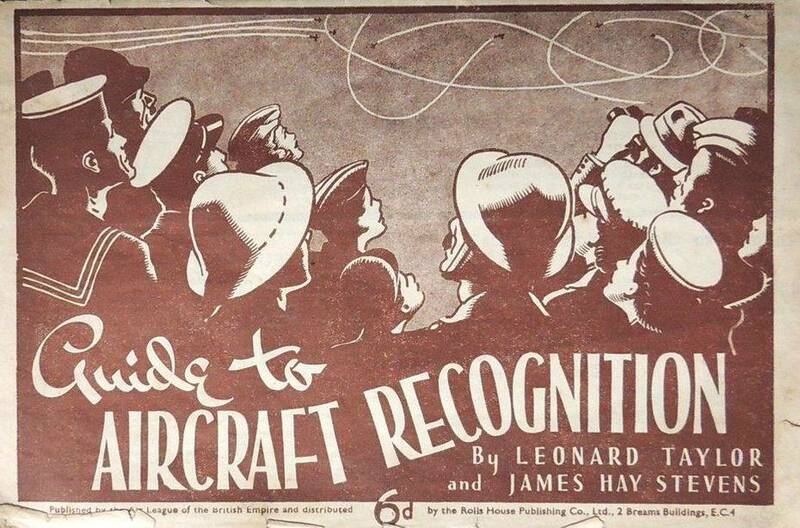 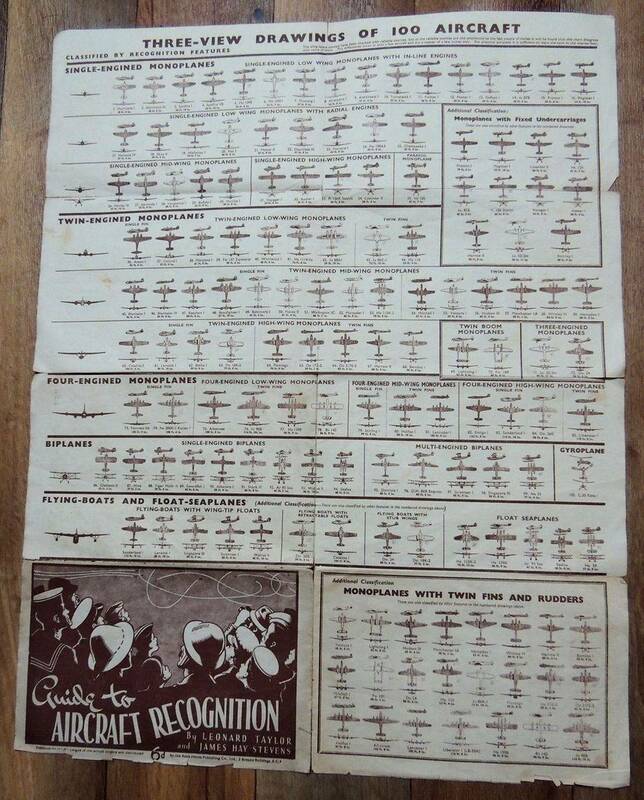 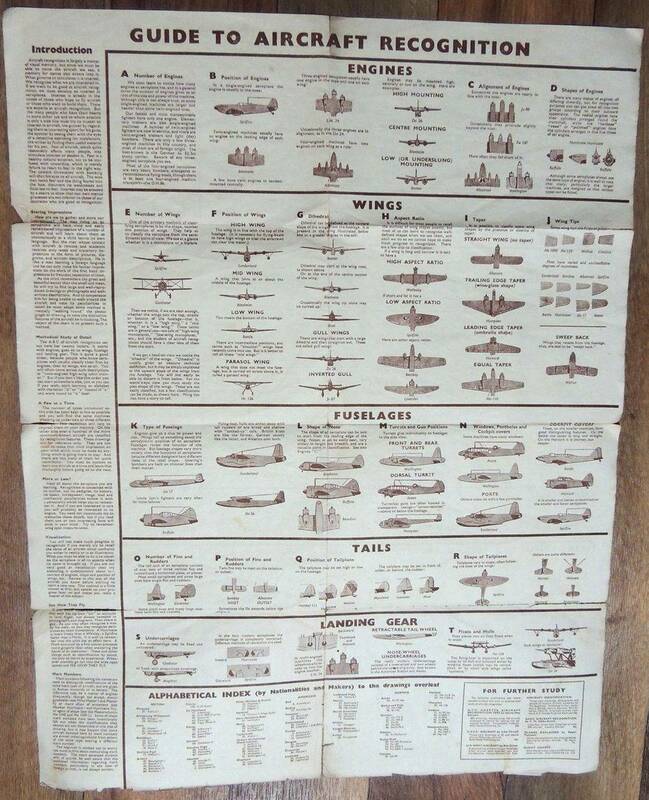 - You Need an Aircraft Recognition Chart! 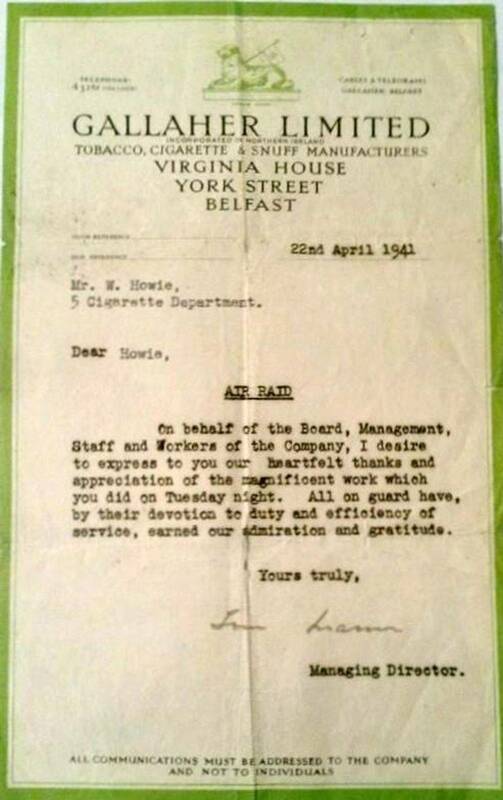 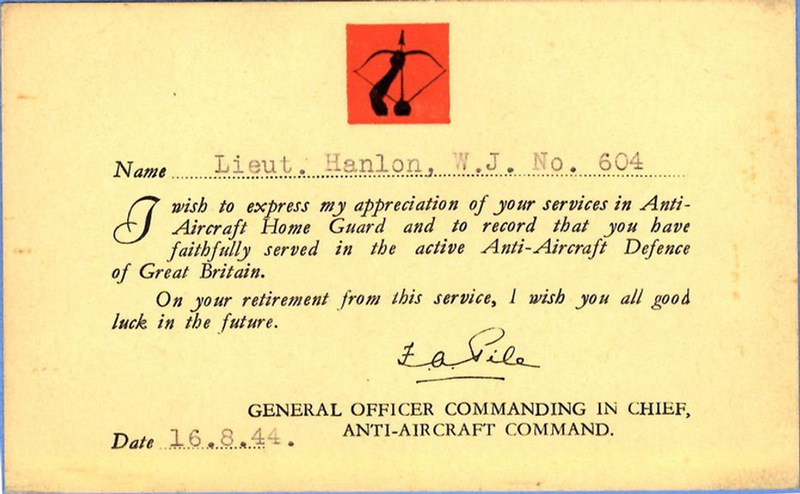 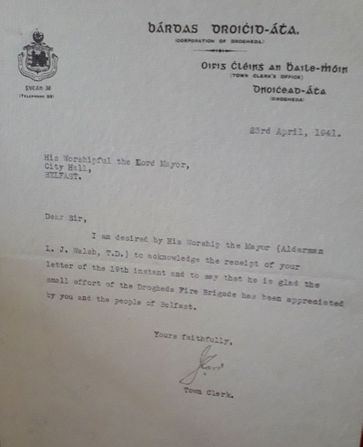 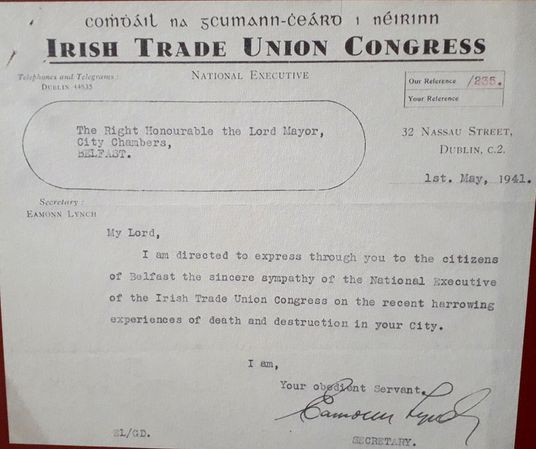 Letters of Support from the Neutral Republic of Ireland. 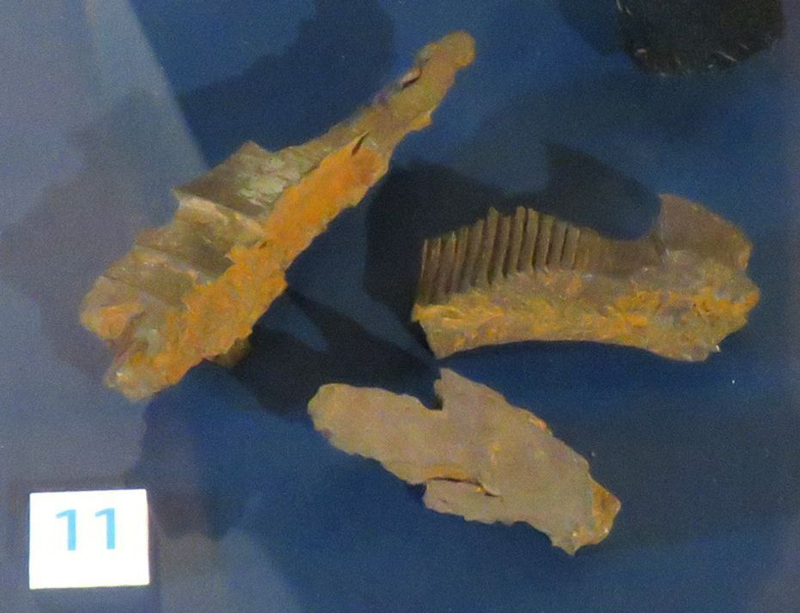 The figures shown above can be seen in the Overloon War Museum in The Netherlands.